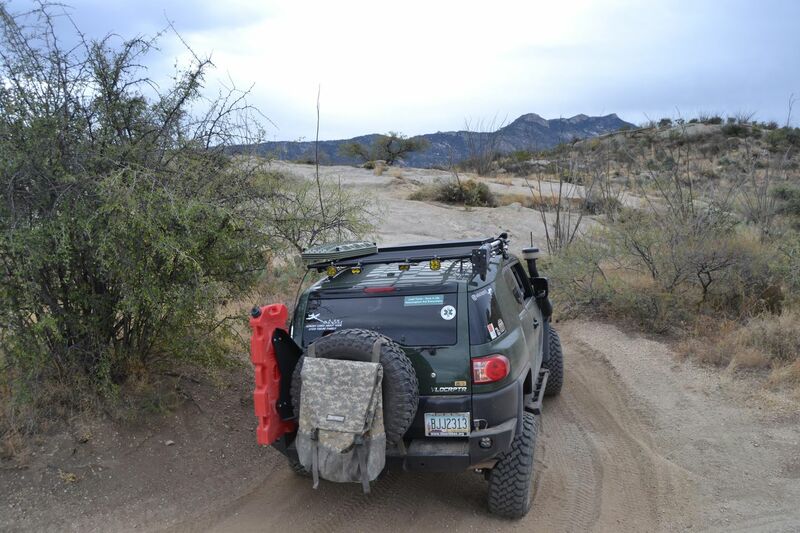 The western Slope Ascent - Climbs up over granite rockface, with shelves and washouts in some parts. 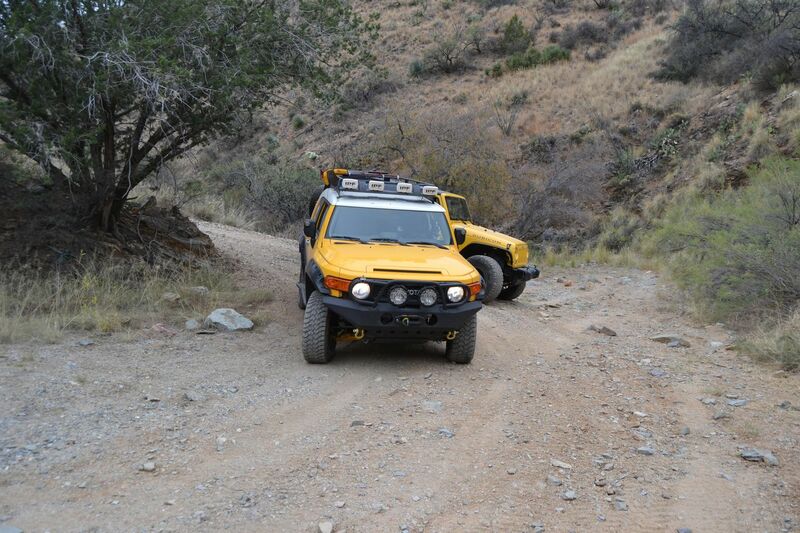 There are some steep climbs up to the pass. The River Bottom - Canada Del Oro river headwaters. 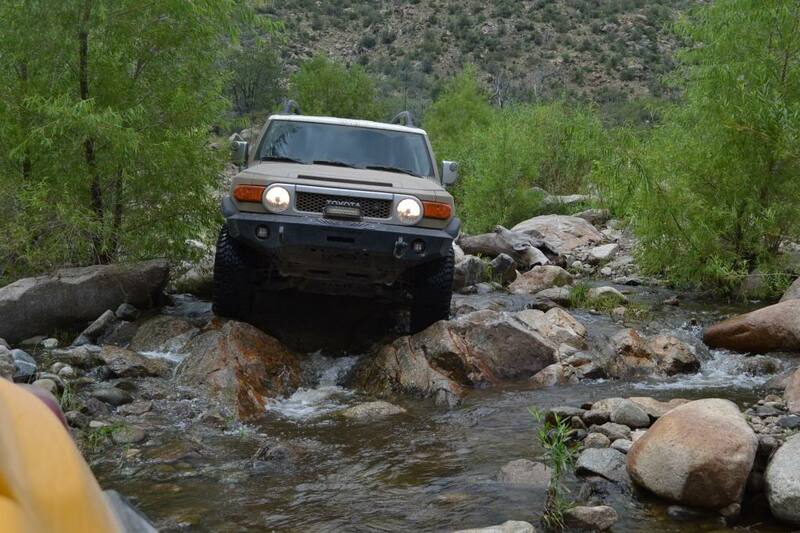 Most often full of water and the beginning of the difficult sections. Expect at least rock slider contact here in the boulder gardens. The Eastern End Ascent to Oracle - Some good hill climbs with significant washouts, spotting requirements, and tight switchbacks. 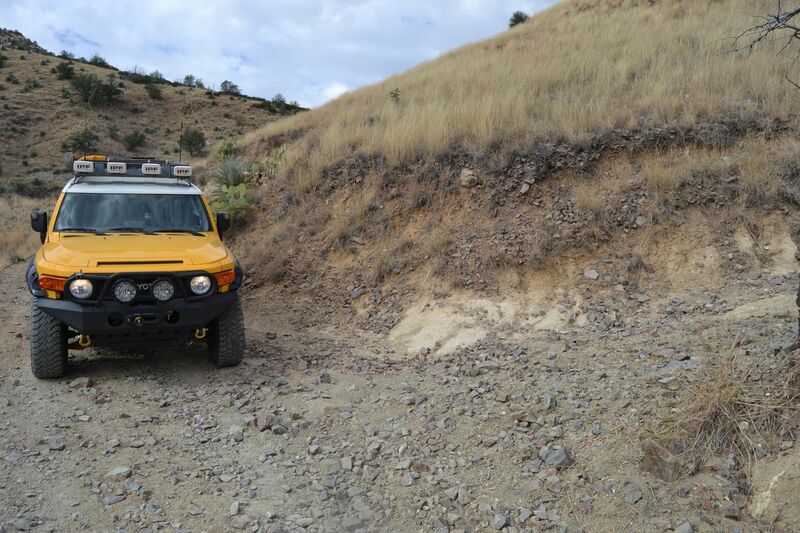 This trail 'could' be completed by a stock vehicle intended for this kind of use, but at a minimum, you should have rock sliders, and skid plates or a very skilled spotter. 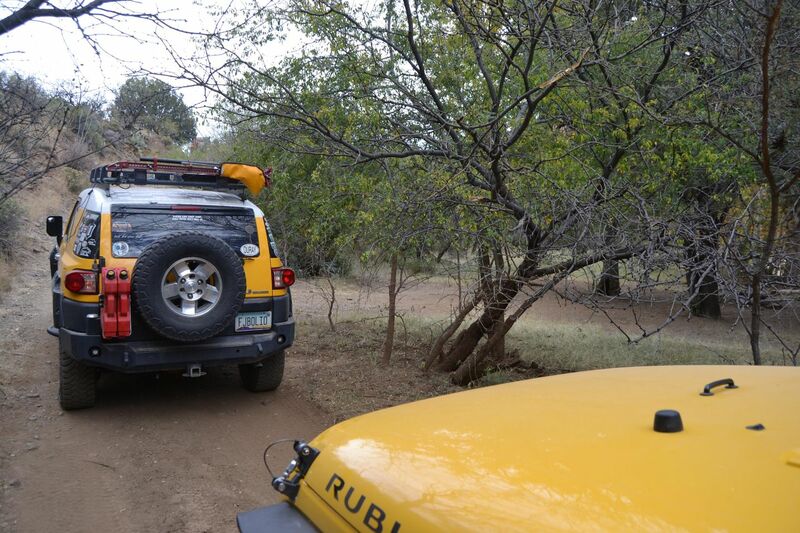 Longer wheelbase vehicles will have difficulty on some of the obstacles. 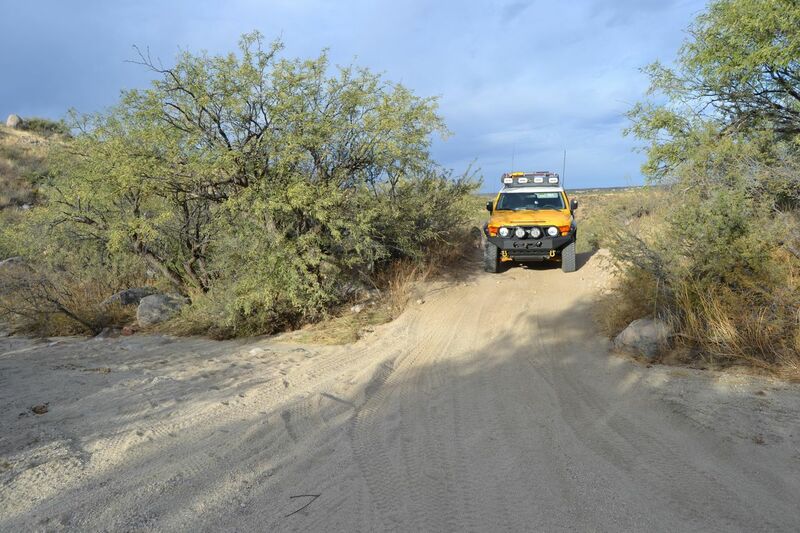 Due to the potential for damage and incapacitation of your vehicle, it is recommended that you never attempt this trail alone. 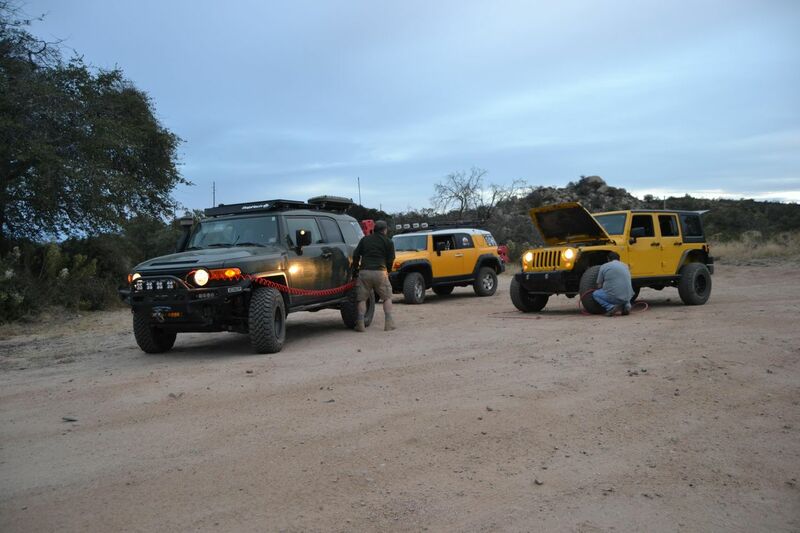 It's a good idea to limit the number of rigs in your group to 10 or less (There will very likely be recovery requirements to get some people through) and more vehicles equal much more time on the trail. 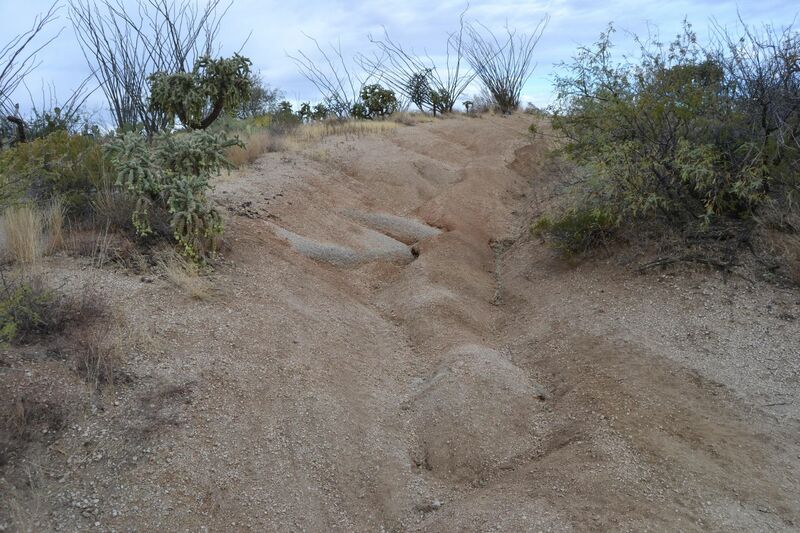 There is a small portion of the trail that can be prone to flash flooding during the summer monsoon rains. Waypoint 22 in particular, is one of these areas that are usually full of water. Turn right (northeast)This is the actual beginning of FR736 which is the Charouleau Gap trail. 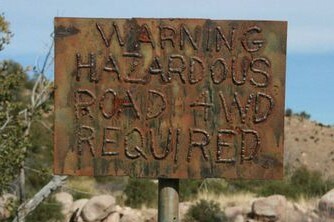 You will remain on this road for the entire trip. The trail begins to the left of the sign in/information kiosk and there is a #736 sign on the right. 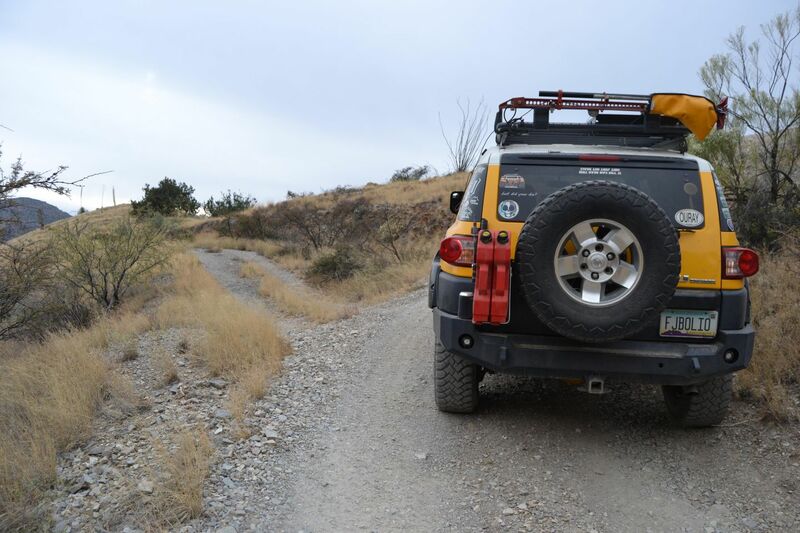 The trail will immediately get rutted and steep here, preventing passenger cars from any further progress. 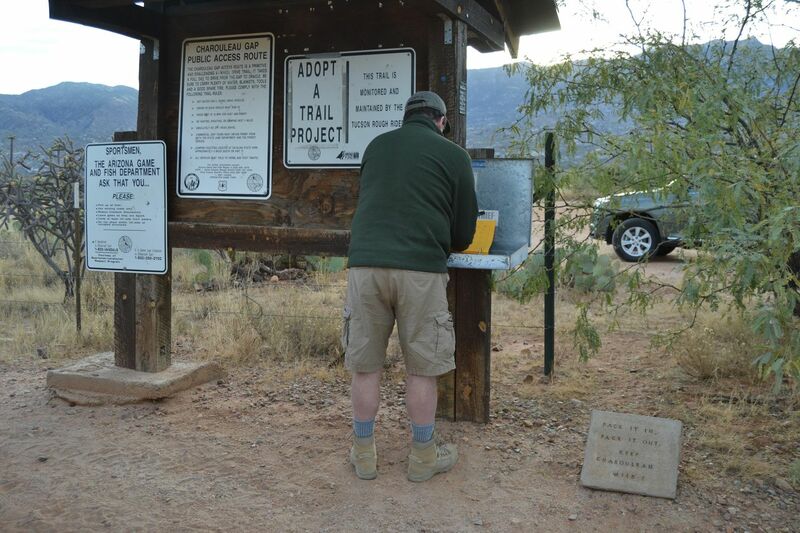 Don't forget to sign in on the register There is a sign here that the TUCSON ROUGH RIDERS maintain this trail. 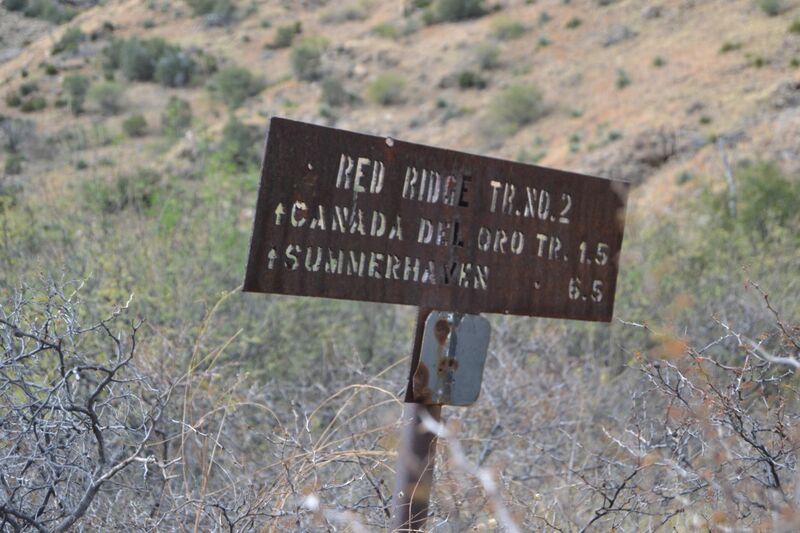 There is another TRR sign on the other end of the trail that you will encounter in several hours. Continue straight (southeast). This is basically a small wash that drops about 12' down kind of abruptly, along with a power line. This is a good spot to engage 4LO as there are many climbs ahead. There's a pretty big power transfer station near here on your left. 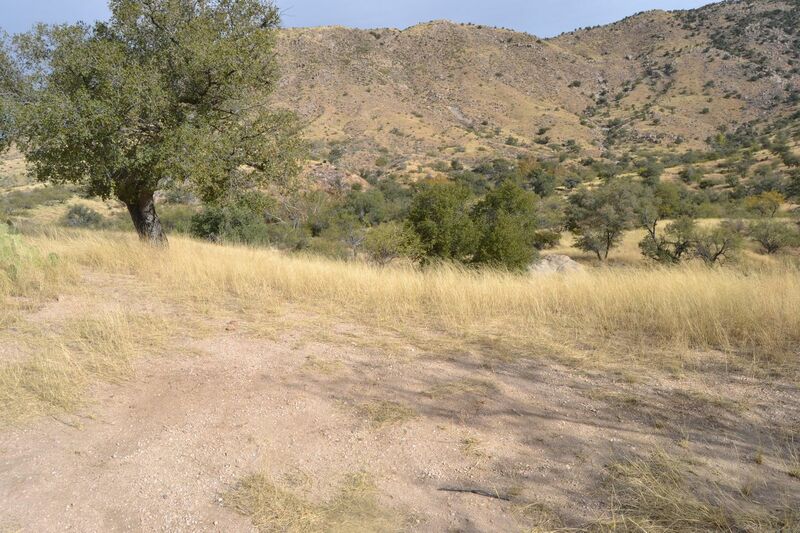 The Canada Del Oro River/Wash (depending on the time of year), which journeyed from east to west through/around the Gap, spills out here along the trail and just beyond this hill, opens out to a wide flat valley. There are still homes on the river banks so please tread lightly. 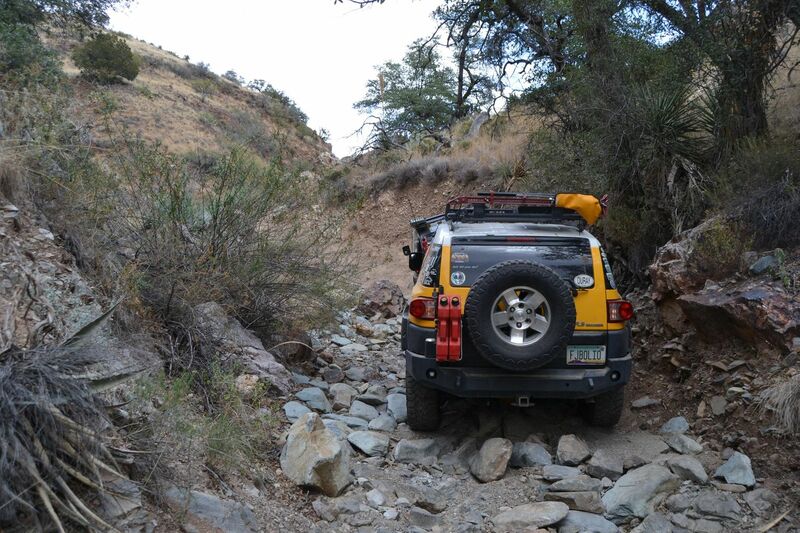 Route finding is pretty obvious, you will cross the wash after descending a steep hill and not follow it for more than 50 feet or so. 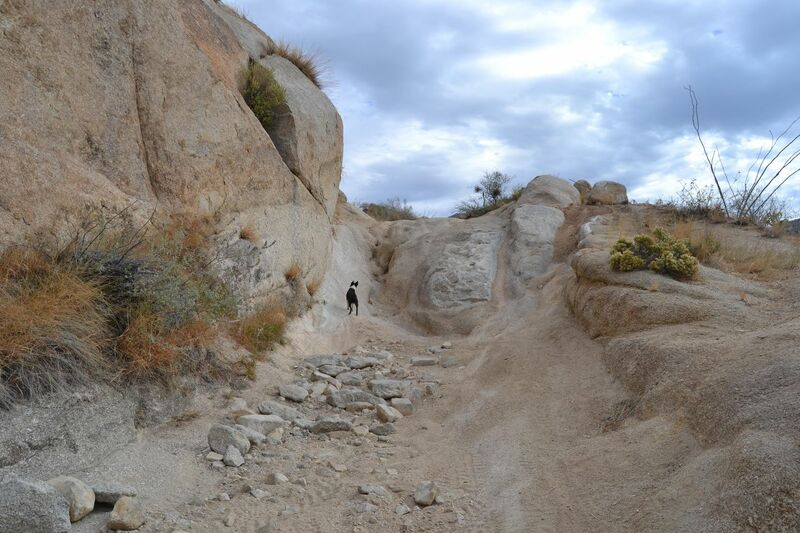 This is actually a pretty impressive descent and ascent down into the Canada Del Oro Wash. 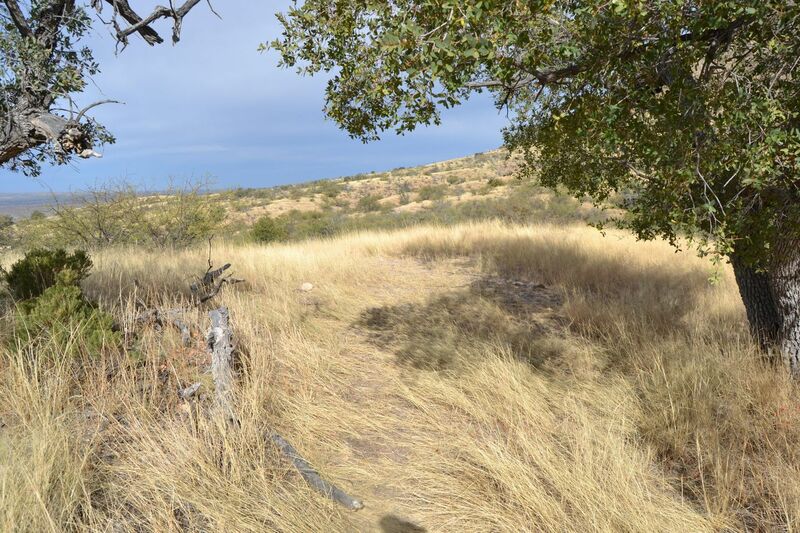 This is one of the major drainages in the northern Tucson Basin and the Charouleau Gap trail follows the stream bed for a significant portion of the eastern slope. This is the only spot you encounter it on the west slope. 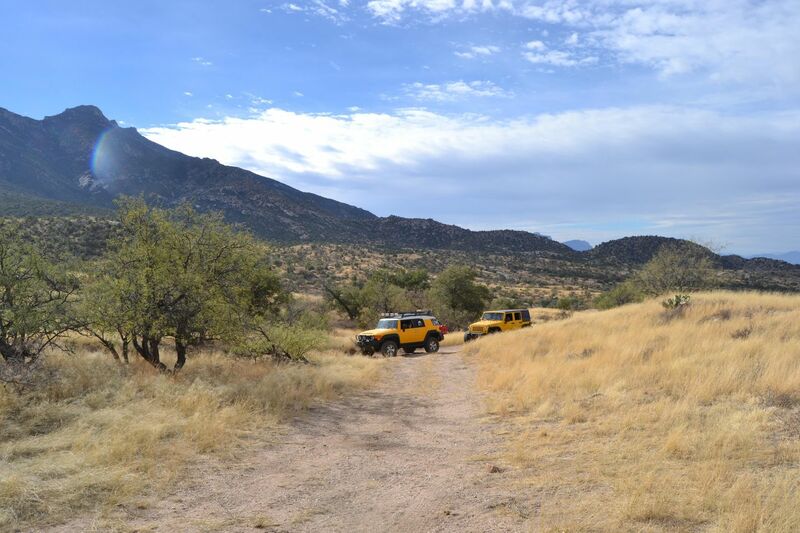 Continue along the powerline for a short distance and the road bends right across the valley where you will cross another streamlet of the Canada Del Oro. 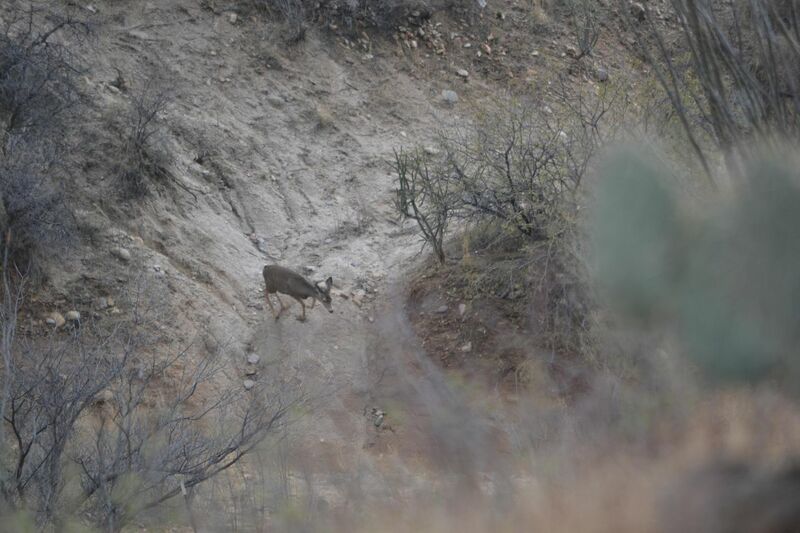 Keep an eye out for wildlife here, it's a pretty good area to spot some deer, coyotes or javelina. Continue straight. 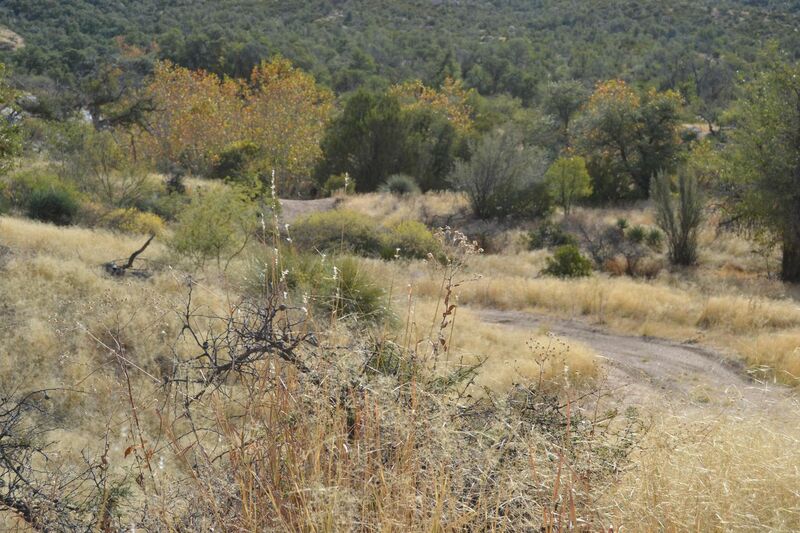 You will cross this without even noticing it but on the topo map, it appears that a road crosses the trail here. 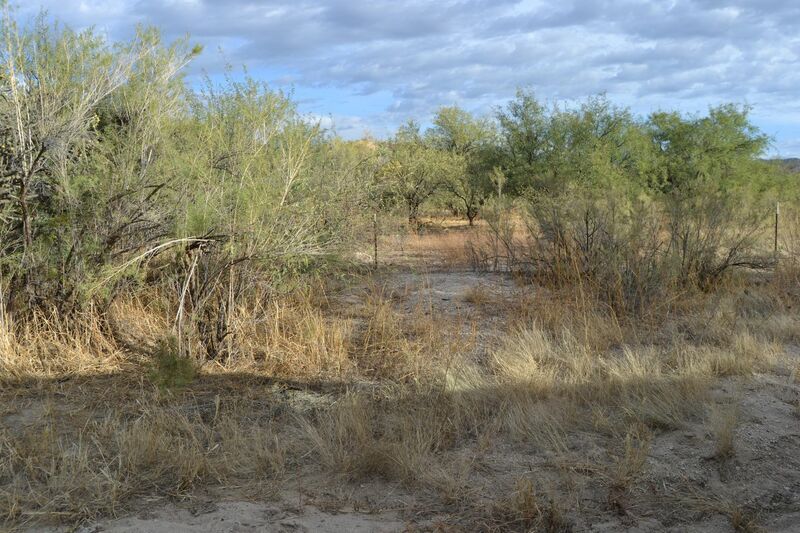 The left side looks unused and the right has a fence that says "Private Property" so there is no path for you here. 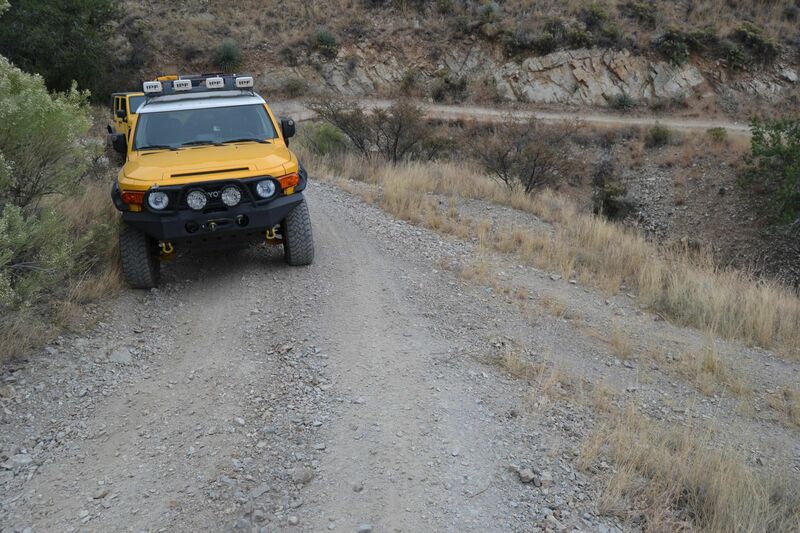 The road "Y"'s here and it doesn't matter which way you choose as the roads rejoin about 200 yards further on. 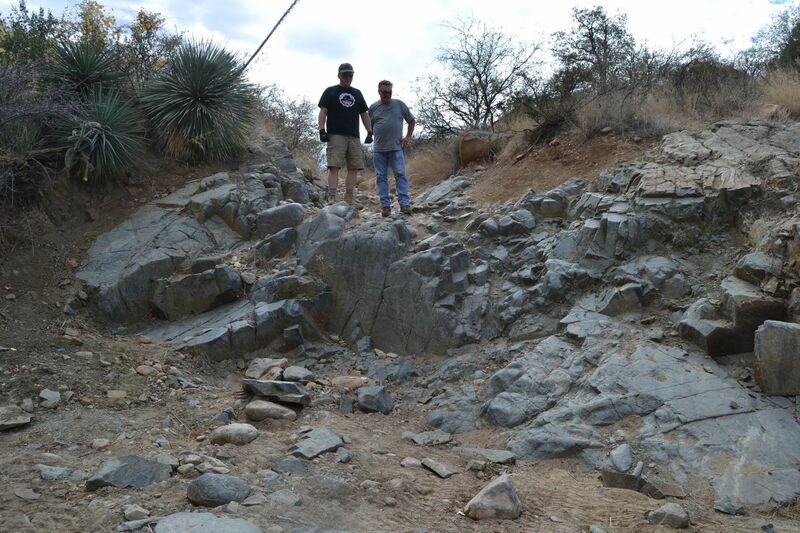 The left is easy sandy wash bottom, the right is rocky and a slight climb. Stay right. 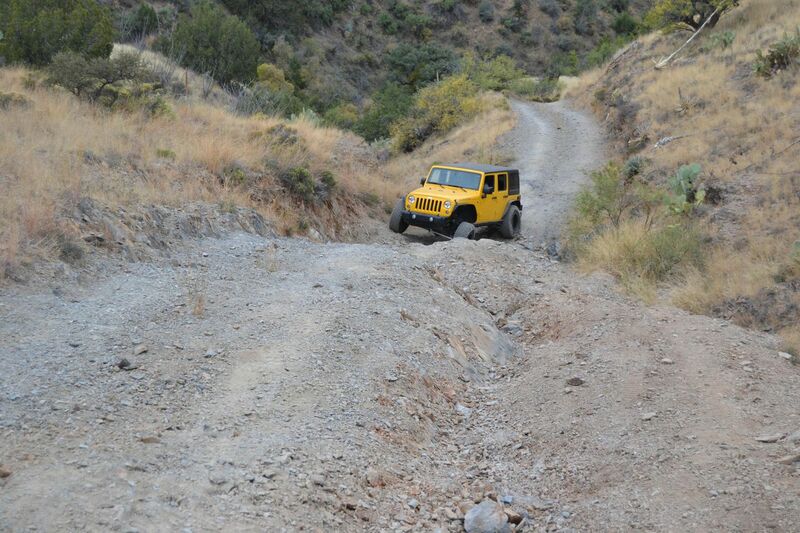 To the left, an unmapped small rocky side road takes off up the hill. 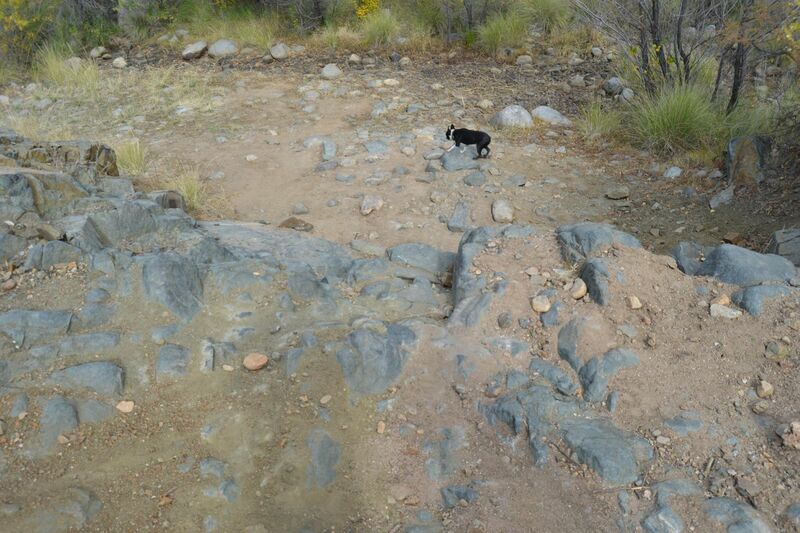 This is a good example of the kinds of shelves/washouts you are dealing with on the western slope portion of the trail. This is a fun little jaunt up a hill to the left, that reconnects to the main #736 road over the crest. This is entirely optional as FR#736 continues to the right. Turn right to access this optional area. 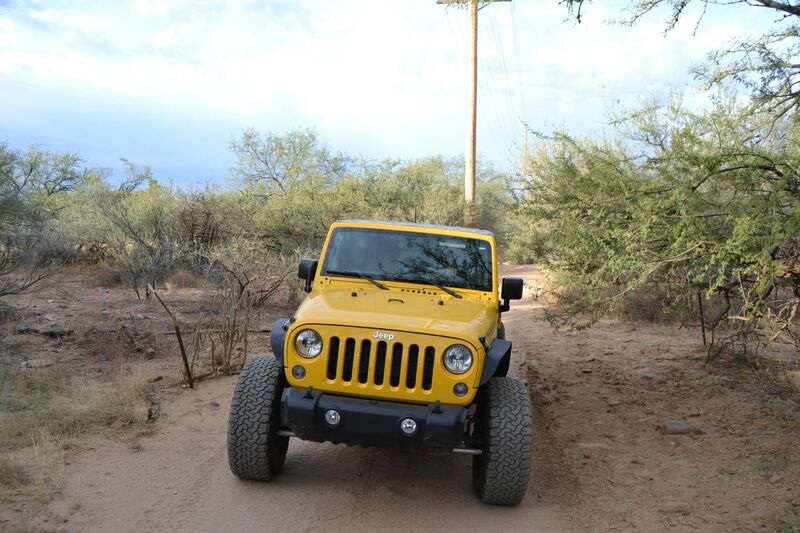 Stay left to bypass it and continue on the trail. 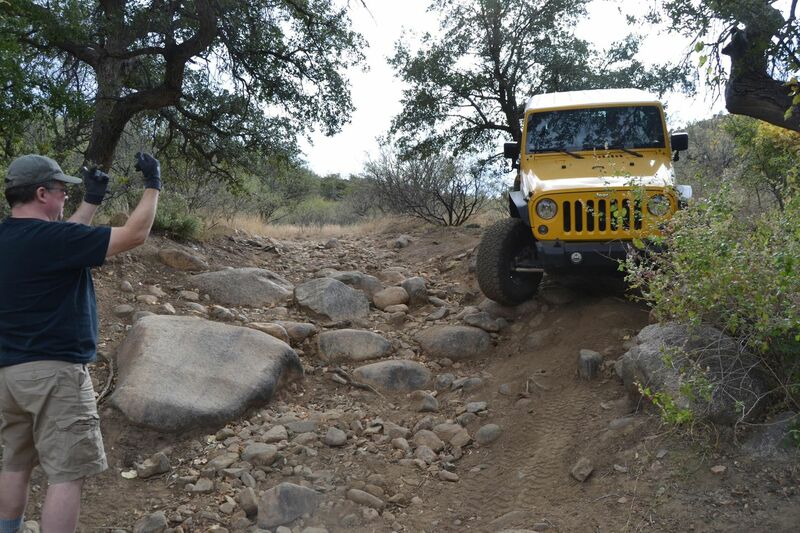 This area is renowned on the Charouleau Gap trail for a fun little optional set of granite rock obstacles. 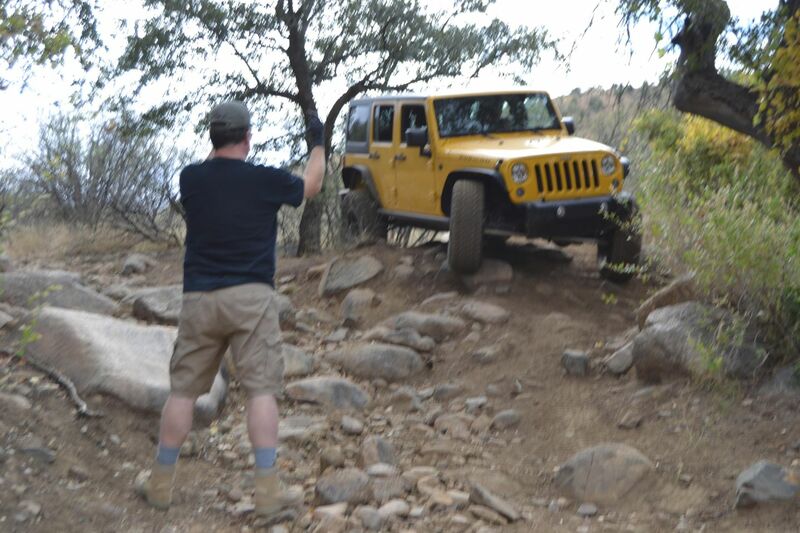 There is a big wall of rock here called "KISS ROCK" that some 4x4's can climb. 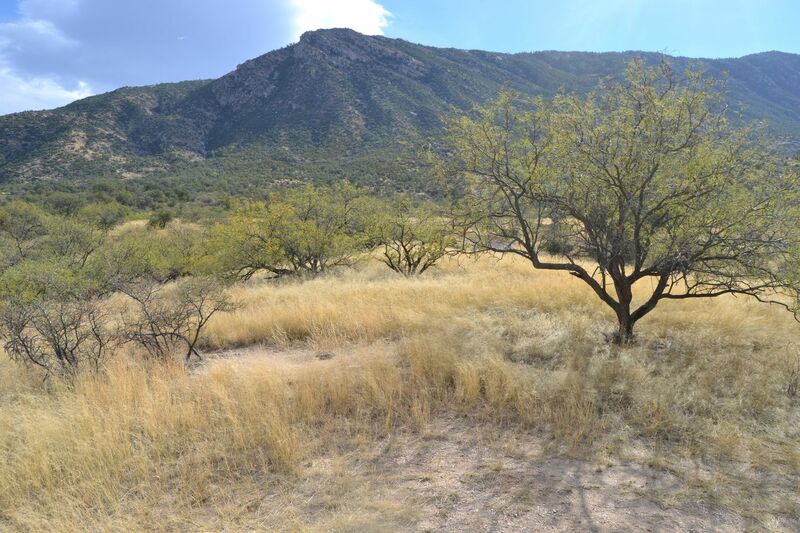 This area is typical of the Santa Catalina Mountain range and many exposed, and weathered (Rounded) boulders and rock faces appear on the Western slope. 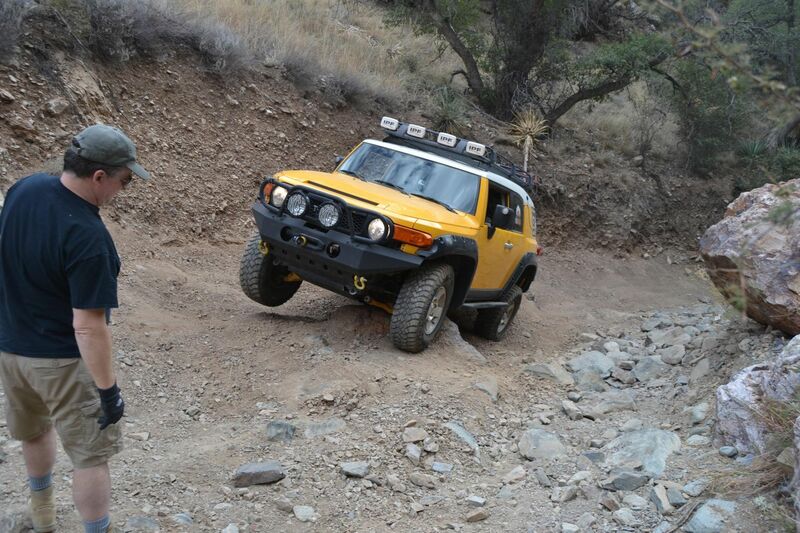 Travelers are not usually successful climbing this because of how far things hang out over the bumper. 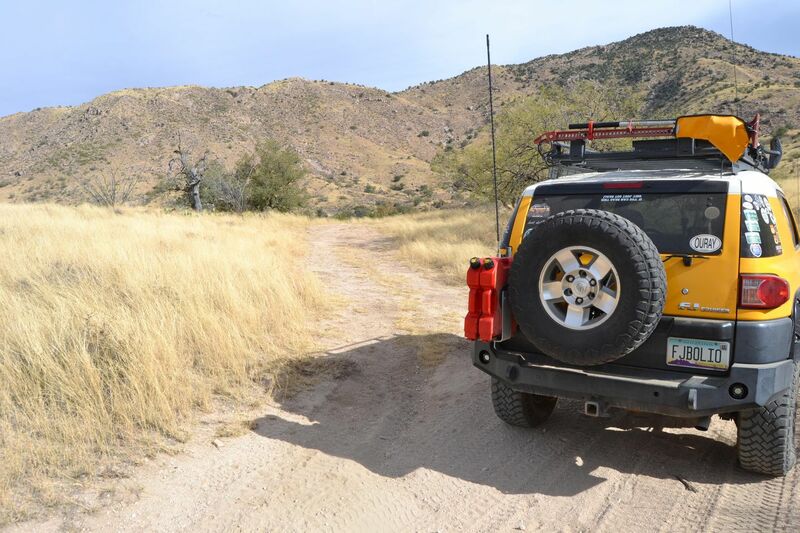 Items such as a rear-mounted spare tire, gas cans, etc which can contact the ground before the vehicle breaks over the top. 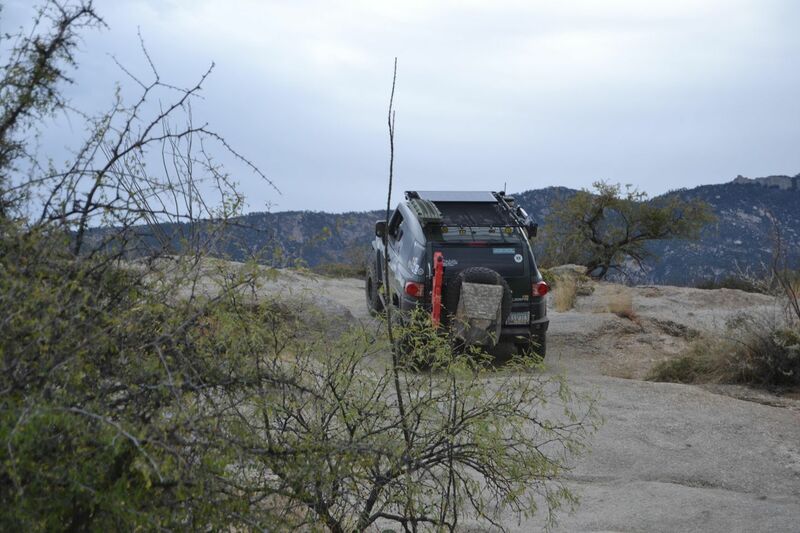 If you decide to turn around somewhere further up the trail, be aware that route finding in the dark can be very tricky here as all of the granite tends to look the same. The trail can either be rejoined at the point you turned right or there is an exit up the rock to the east that will re-connect to the main trail. Off to the left is a small road that climbs a hill to a pretty neat dispersed campsite. 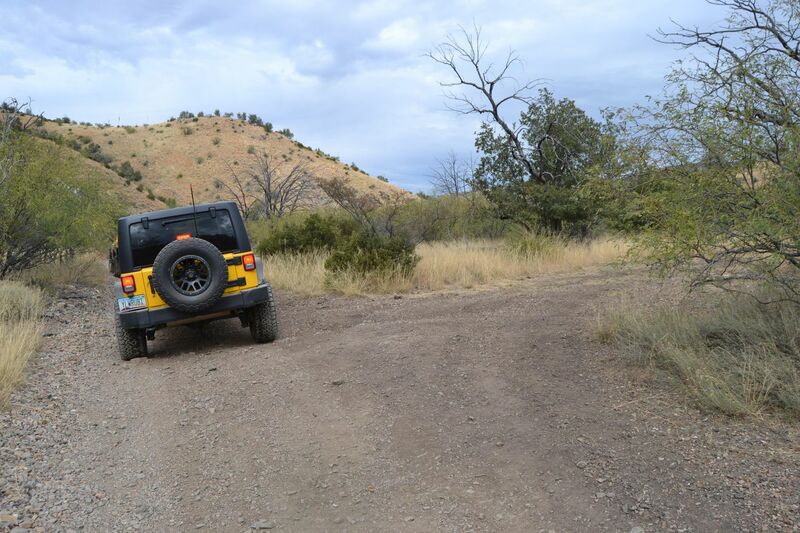 The road is a loop that descends back to the main trail. 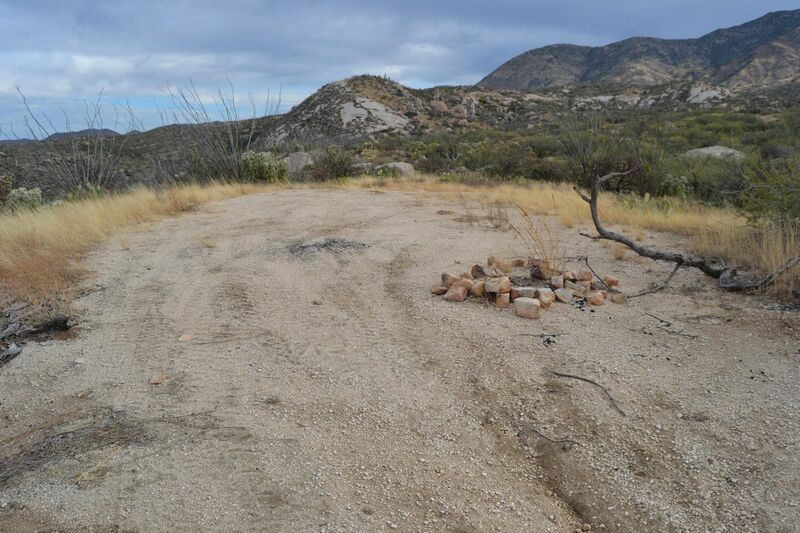 There was a fire ring here and great views of the Oro Valley. Turn left for the "Unsurvivable" obstacle bypass route. 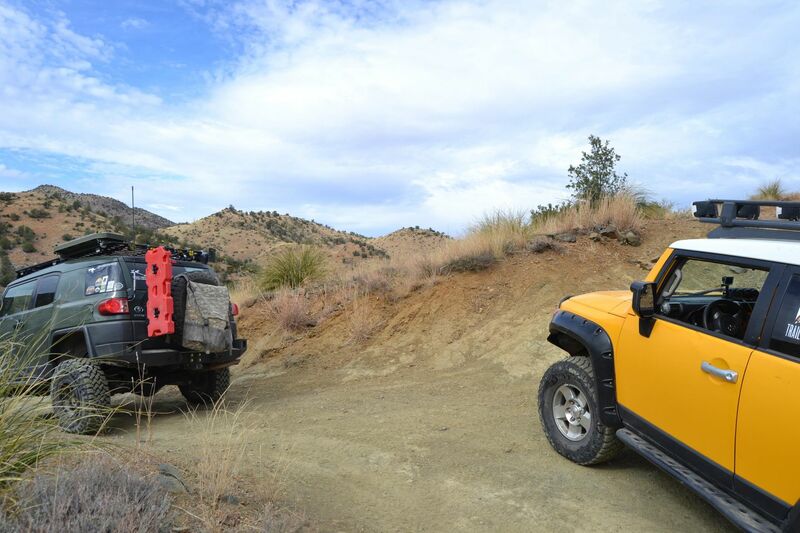 "Unsurvivable" is the one of the most iconic obstacles of the Charoulea Gap trail. 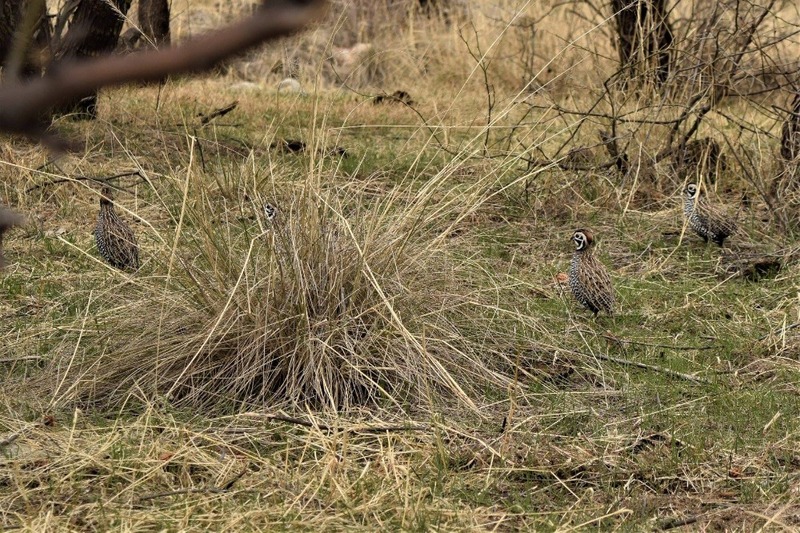 "Unsurvivable" was jackhammered by the USFS to improve wildfire fighting access back in 2010, and it's easier to get up now, but still challenging and intimidating. This is the Bypass route to the left, and even the bypass is tough, with big boulder climbs, and a tight turn to the right that must be navigated. The bypass is about 150 yards from the obstacle and comes out just above it at Waypoint 12. Here it is! The obstacle everyone tests their courage on. But it's not as hard as it seems. It was once much worse than today. Nature is slowly returning this obstacle to what it once was, pre-2010. 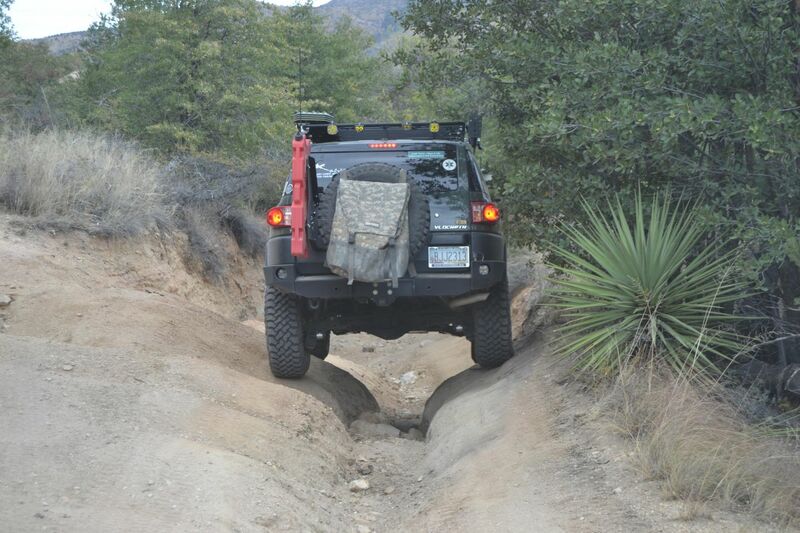 If you approach slowly and put your passenger tire in the groove to the right, you can climb right up this obstacle. 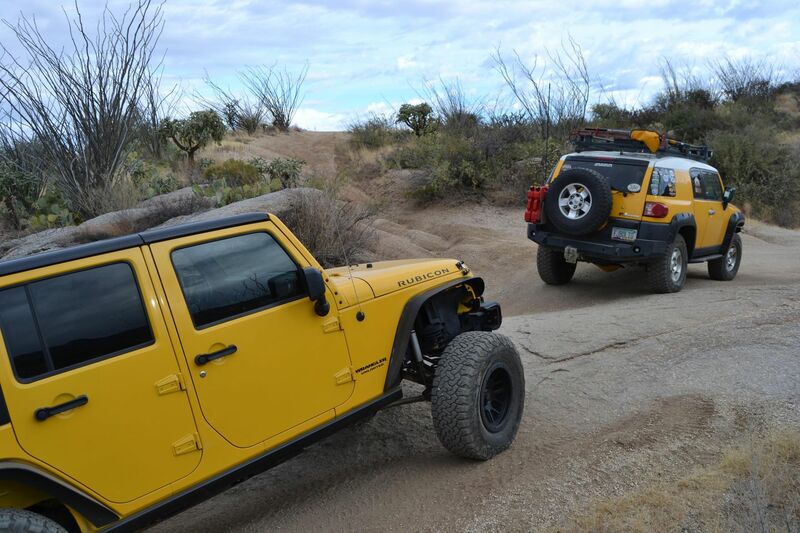 If you are unlucky and put your tire too far to the right, you can easily roll over into the crack. This is a good location to use a spotter. ROLLOVER DANGER! 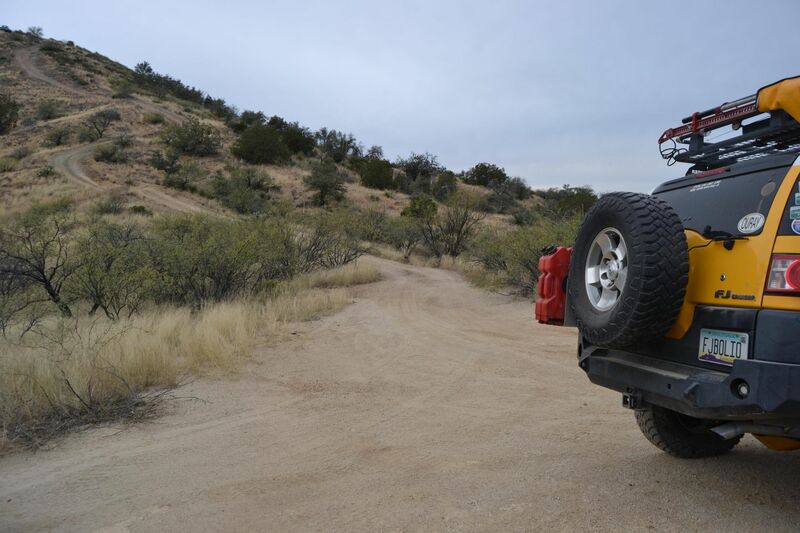 The Unsurvivable bypass rejoins the trail up here near a cattle guard. The bypass comes in from the left (west) There is very limited foliage to hide behind should you need an undergarment change after the obstacle. 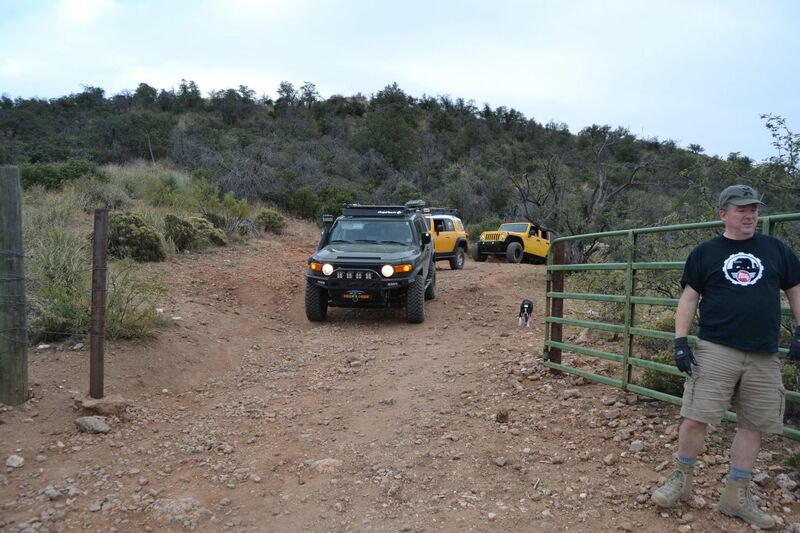 But, the cattle guard is a good landmark that you have completely cleared this obstacle. 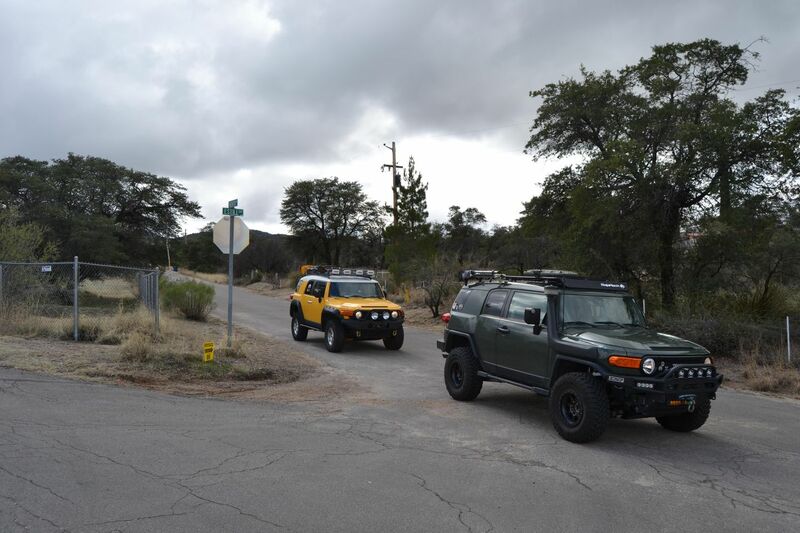 Two Forest Service roads intersect with FR#736 here in a rather large confusing intersection. FR#4432 is the first you encounter which heads off to the south and dead ends at Cherry Tank. About 150' further up (Stay straight) FR#4496 heads off to the west/Northwest. The top shows this road heading all the way back down to civilization in Catalina, and also linking up with FR#4495, you can explore this road if you care to. Both roads are clearly marked. To the left, is another non-descript flat spot and fire ring. Very nice views of the western slope and valleys below. Stay left. 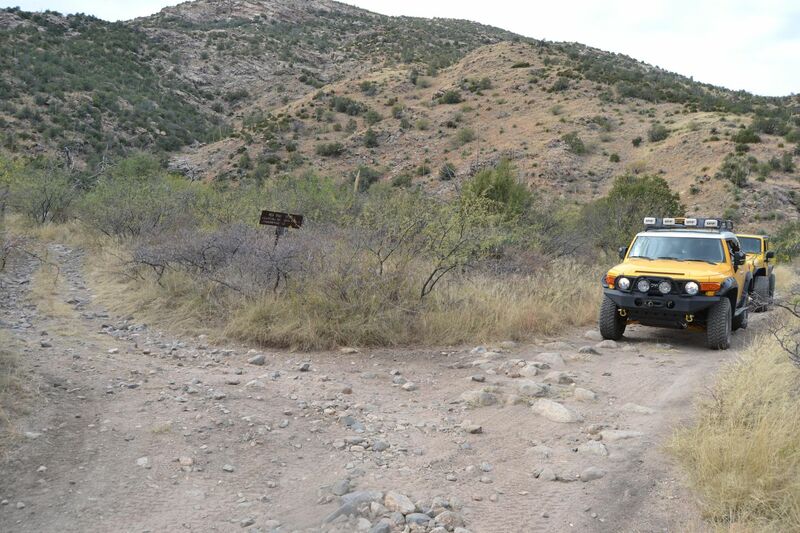 To the right, is a road unmarked on the topo map which appears to head down into a heavily wooded wash area. One would expect there to be a camp spot down under the trees. 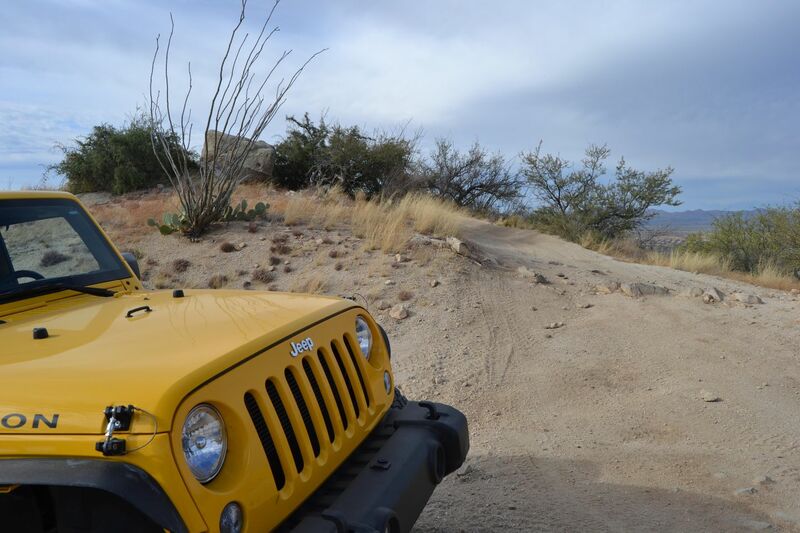 The road looks almost as well traveled as the main road. 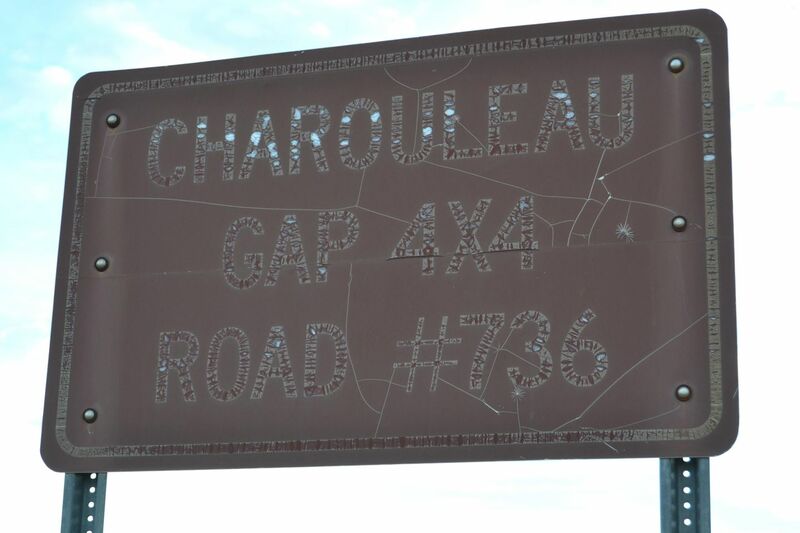 This is the actual geographic point of Charouleau Gap. 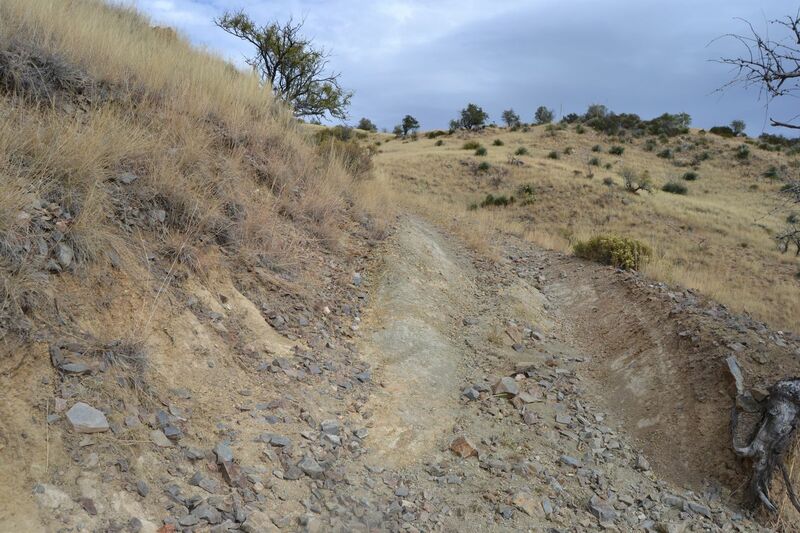 A saddle between the western and eastern slopes. Don't congratulate yourselves just yet. 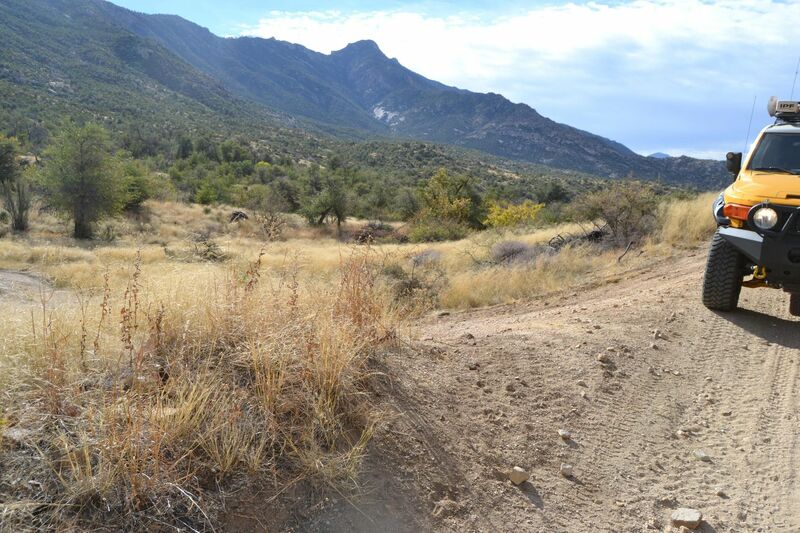 From here, many choose to return down the western slope as the most challenging part of the trail is ahead. This is a great spot for lunch as there are some oak trees up here for shade. 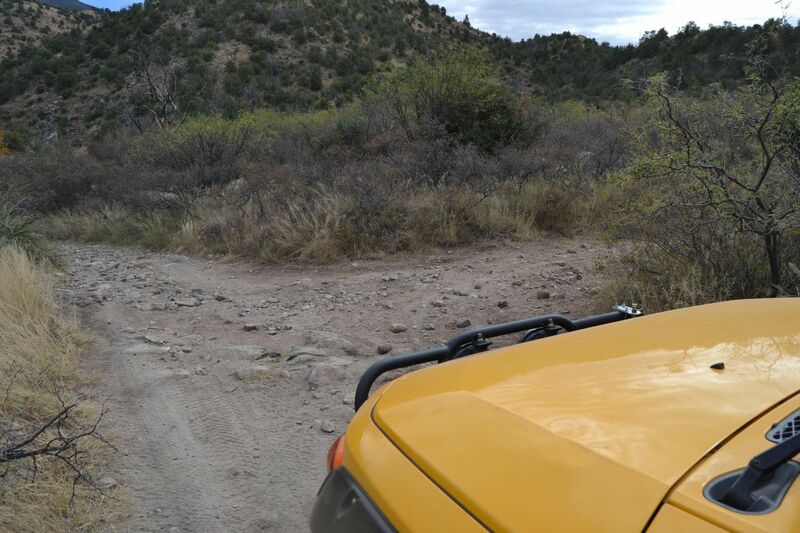 There is a cattle guard here that makes for a good "I'm in Charouleau Gap" photo. 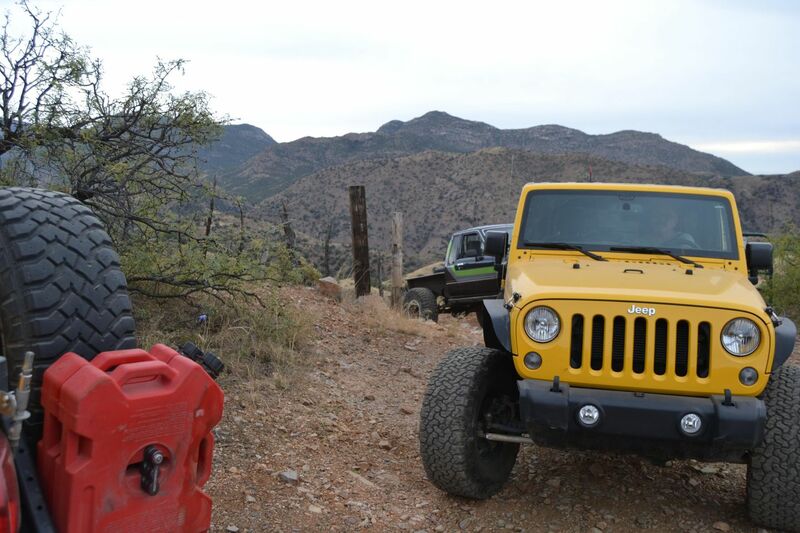 You can also look back down the western slope for a nice view of the climb just made and Oro Valley in the distance. 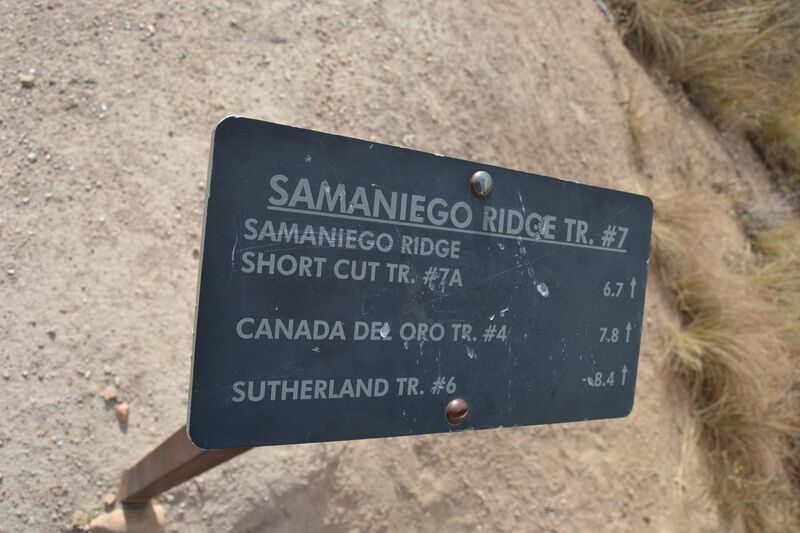 The Samaniego Ridge trail intersects to the right and actually looks wide enough to have been a road at one time. 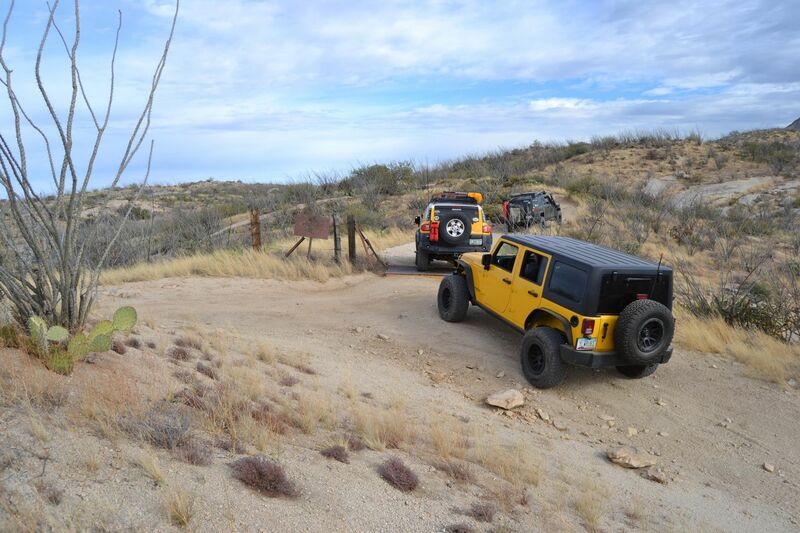 This trail leads up to the top of Mount Lemmon and Summer Haven which is the end of the Mount Lemmon Control Road trail. This is an insanely deep "V" near the intersection with FR#4494. You will have to carefully straddle this obstacle as the drop off would tip you onto your door if you drop a wheel down into it. You may want to consider a ground guide here. It's not required. but makes good sense Stay right and straddle the "V" as you descend down from the Gap onto the eastern slope shelf road. 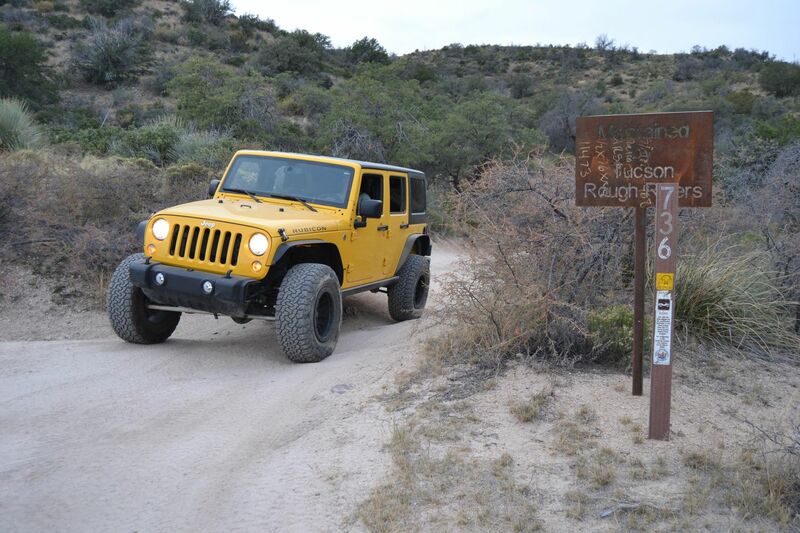 From here you will drop quite a bit of altitude as you descend into the Canada Del Oro Canyon (which means Canyon of Gold) but other than the washouts, there is not much to be concerned about. 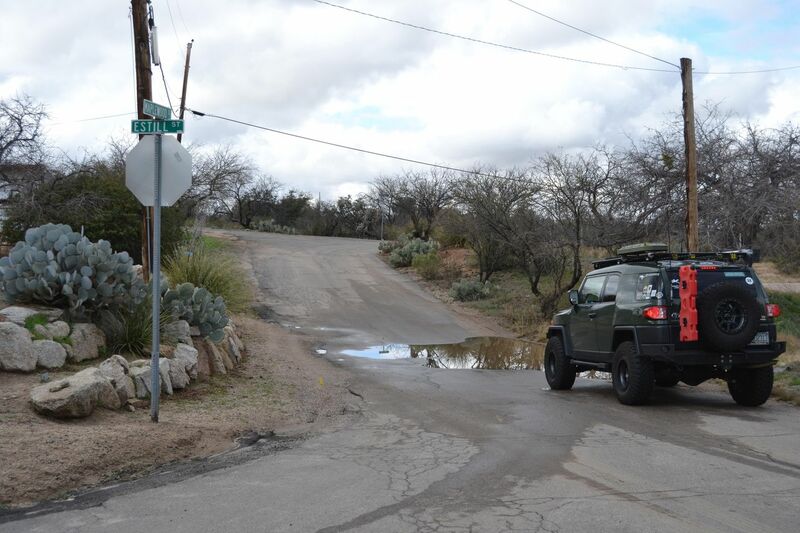 There are several spots to pass if you encounter an ascending vehicle - which of course, has the right of way. 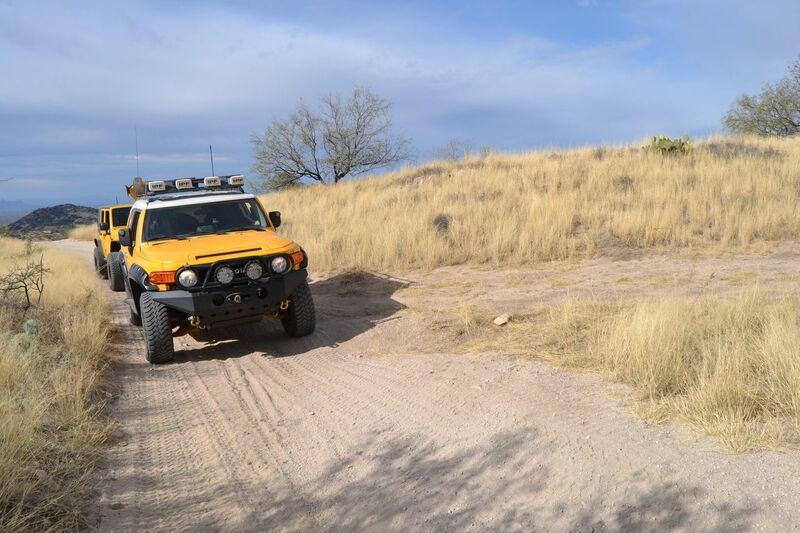 Most of the shelf though is little more than a vehicle width, so a sharp eye down the trail is a good idea to see if an ascent is in progress. Stay right. A sharp left turn up the hill leads to Pig Spring. 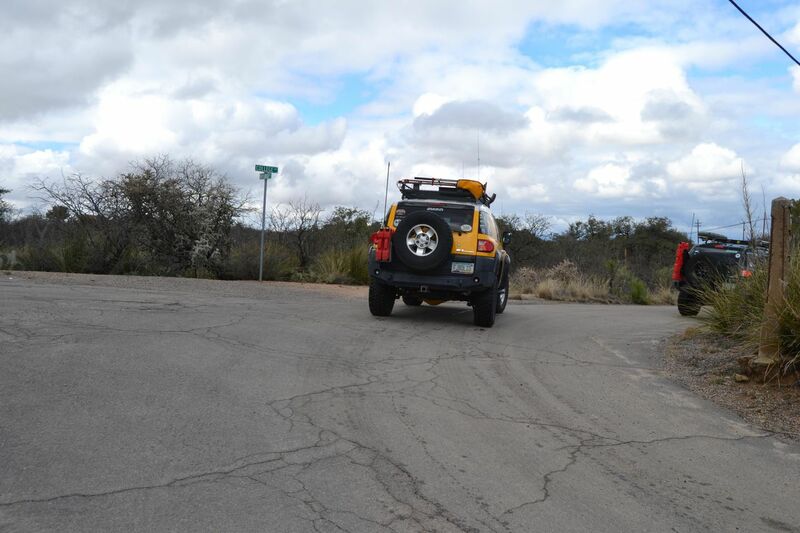 The topo says it is a short road and dead ends near the spring. 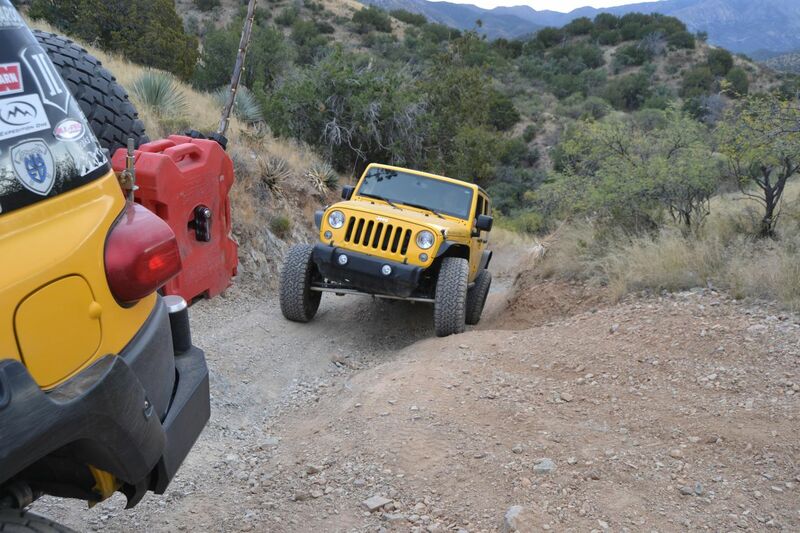 Stay right and continue down the hill on the shelf road. Continue Straight. 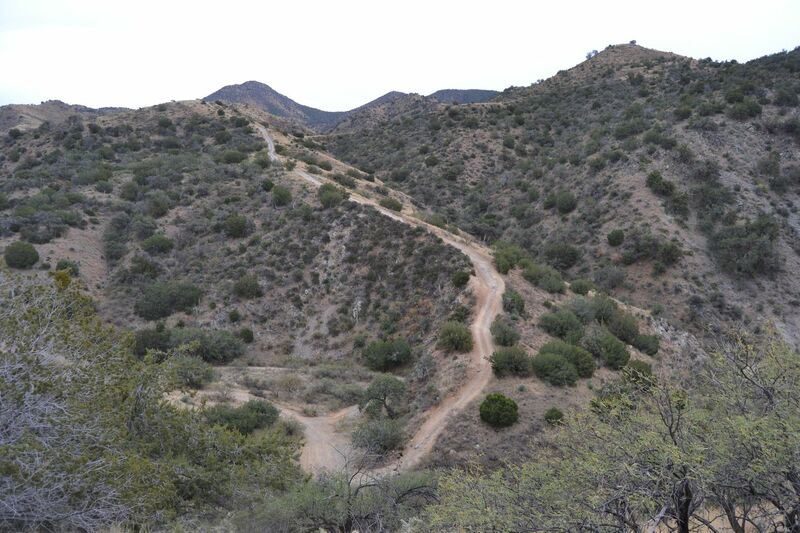 This is part of the Arizona trail and heads back up the mountain side to the top of Mount Lemmon. 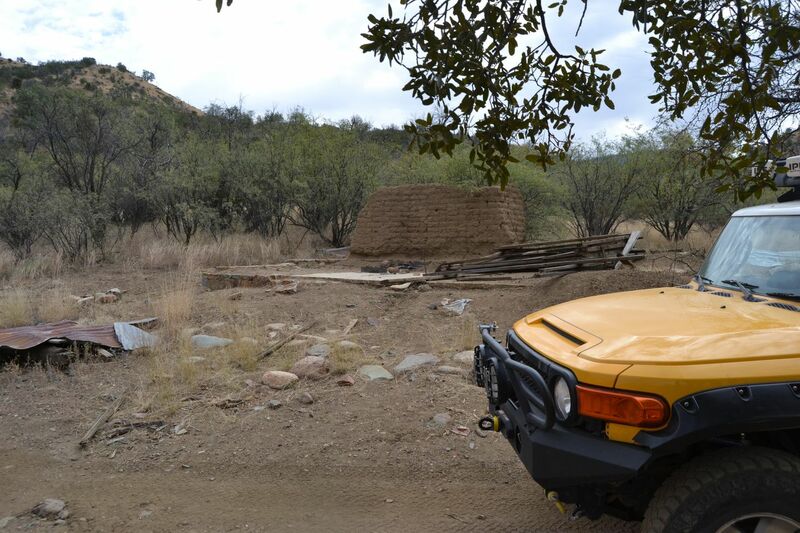 Seems like an odd spot to be shuttled to for use of the trail, but it crosses the road here, in the base of the valley. You had better heed this warning. If you have them, smacking your rock rails is highly likely here. If you don't have 'em...Well, you should have some. 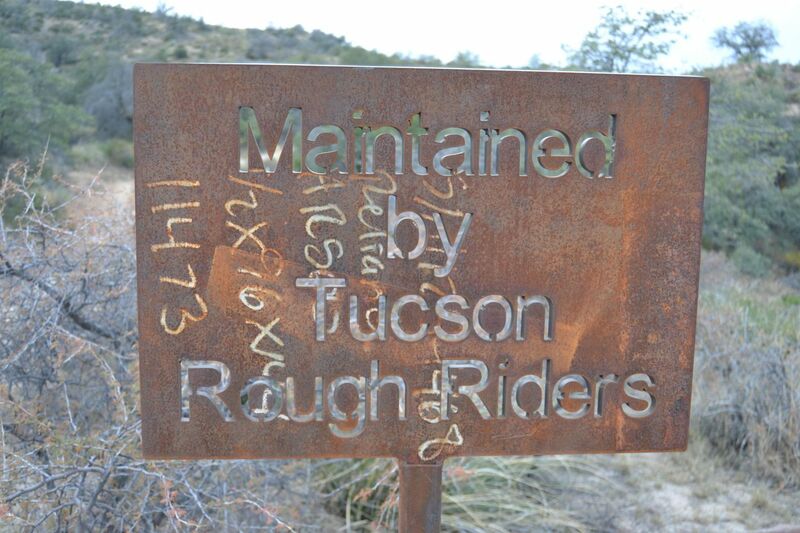 This welded sign was placed here by the Tucson Rough Riders and pretty much marks the part of the trail that will become much more serious. A wonderful boulder garden awaits you here. 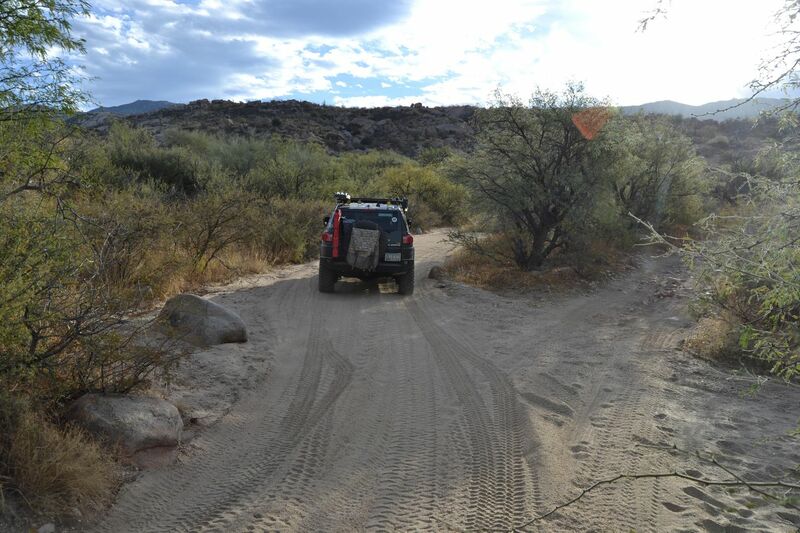 The boulders are 12" - 36" here and when the Canada Del Oro has water in it, Navigation and spotting through this area becomes more tricky. 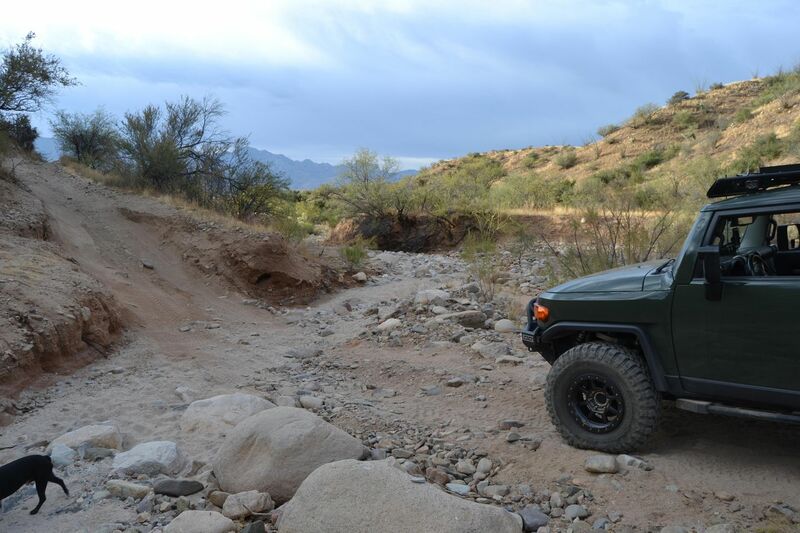 At different times the river bottom can be dry, however, the boulders don't get any smaller. This road leads off to a bunch of shafts and prospects off to the right. Some old dead trees help mark the spot. 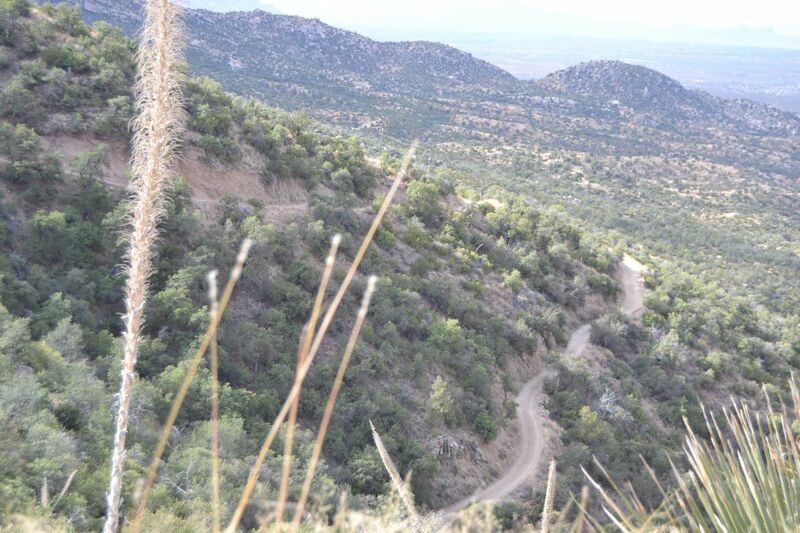 The topo shows this as a pack trail to the top of a hill at 4,983'. 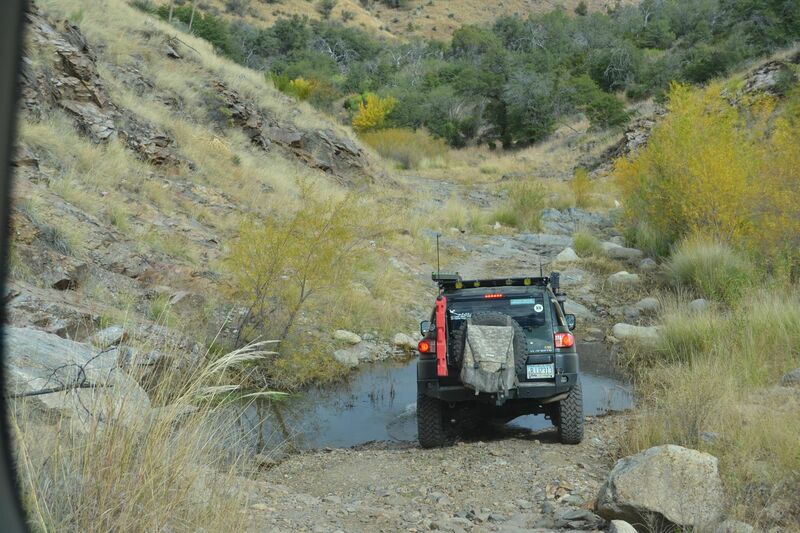 The "Car Wash" is another well-known obstacle on the Charouleau Gap Trail. This is the actual headwater section of the Canada Del Oro River/Wash and as such, occasionally has water in it up to 40" deep. 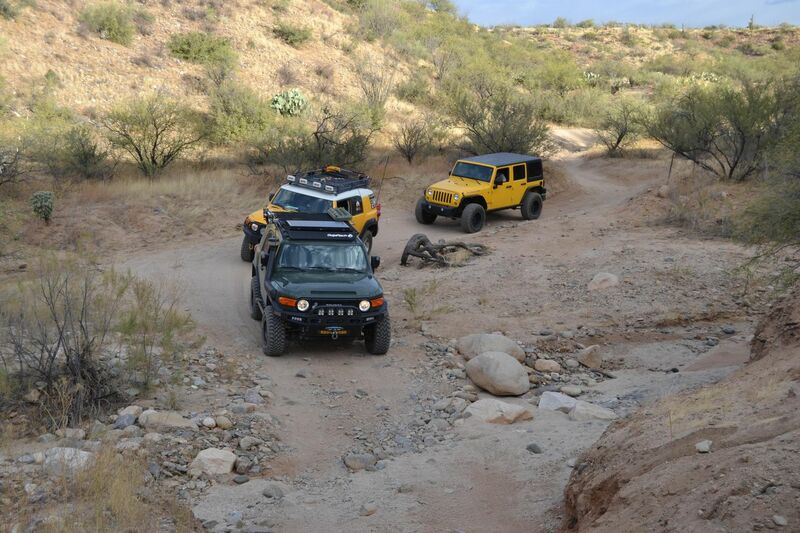 This is a particular concern should you be in this canyon during Southern Arizona monsoons in June, July, and August. It's difficult to find a good location to provide spotting as you'll be standing in some cool mountain water. 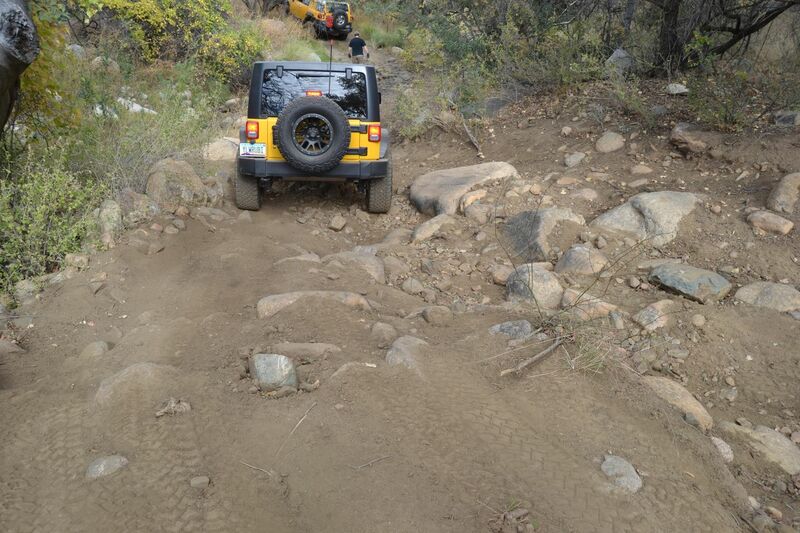 There are several very rocky boulder gardens to cross until you actually drop down into the river bottom. 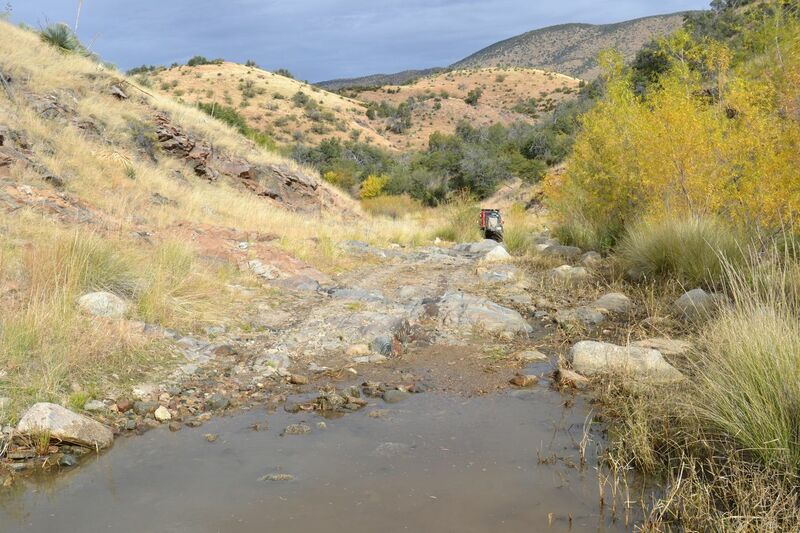 The Car Wash obstacle is only about 150 yards long and exits out to the right, ascending a small challenging rocky hill. 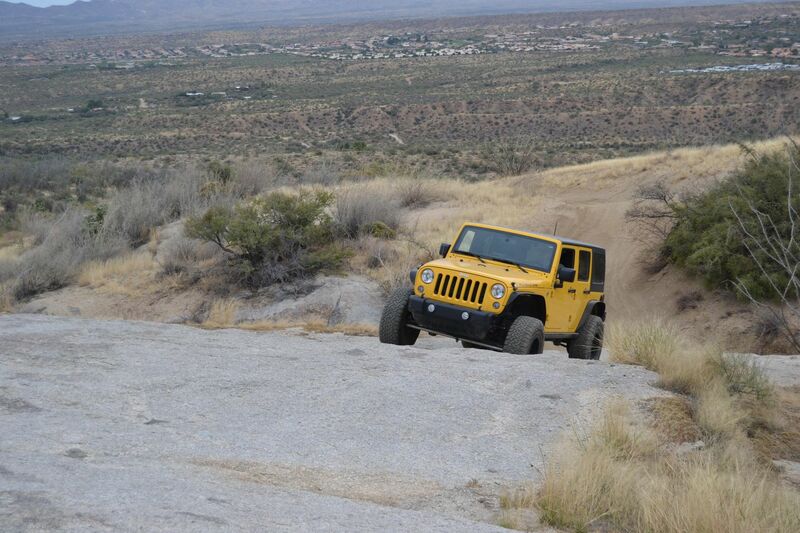 If you are unsure of your skill at navigating this kind of terrain, this is a good spot to turn around. 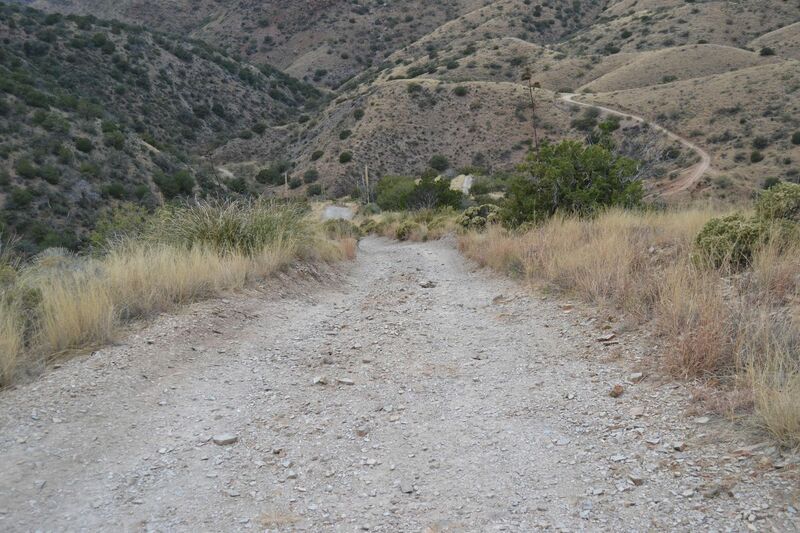 This is a steep hill that crests and turns a sharp left. 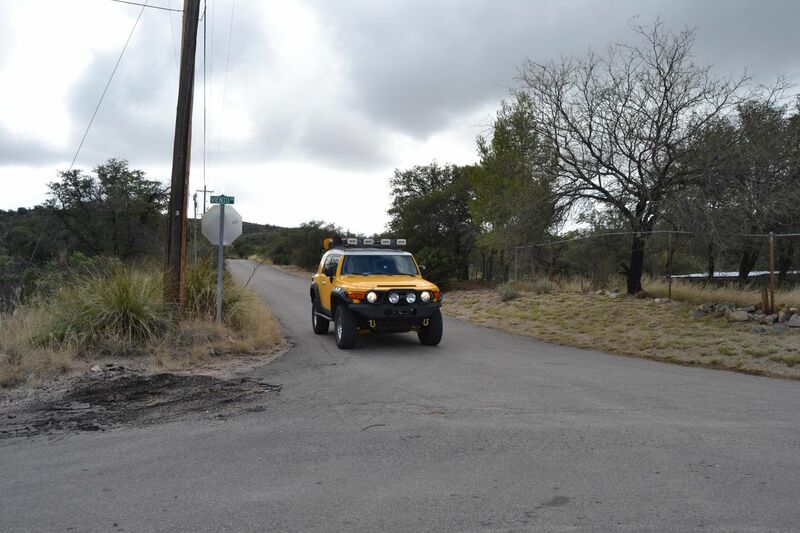 (which you may not be able to see over your hood) There is another unmarked road that heads up the hill to the right. The Trail continues over and down to the left. 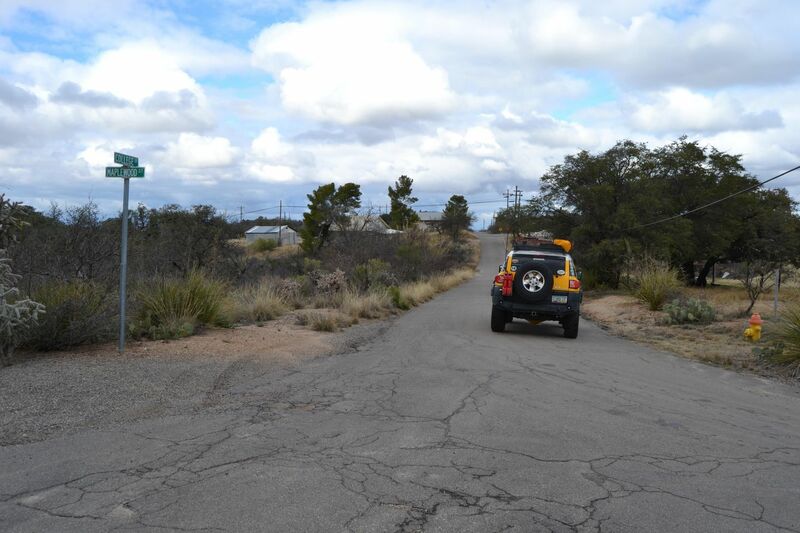 Neither of these roads is marked on the topo. 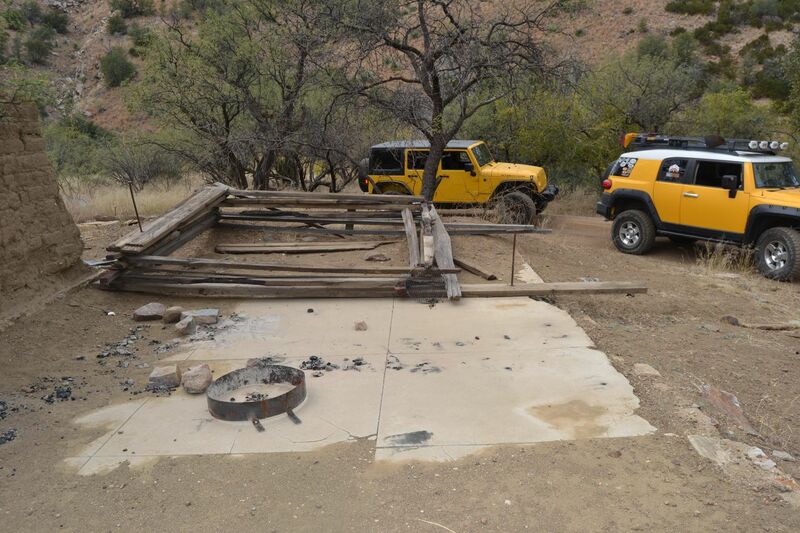 This was a small camp area that housed miners in the early part of the 20th century. 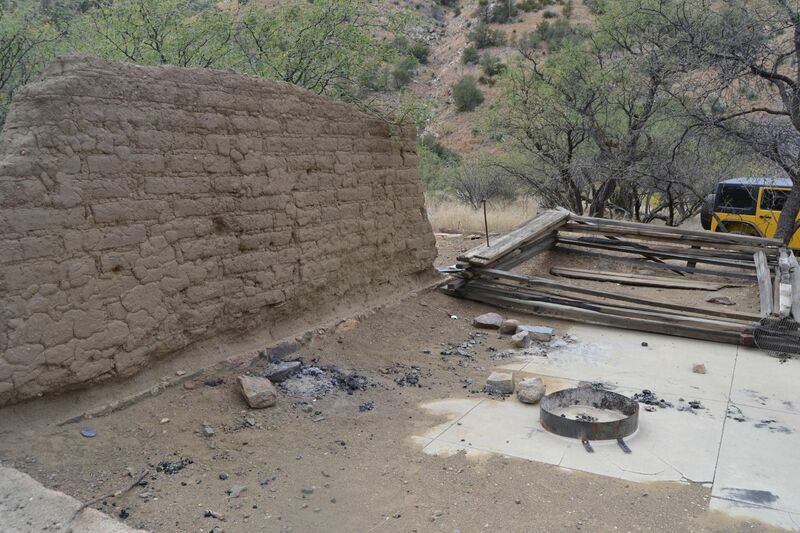 Not much history remains other than a single adobe wall atop a large concrete pad. It's a shame that time, vandals and a fire in 2005 have all but erased this spot from the map. In the 1980s, this cabin still had a roof and four walls. click here for an old comparison Evidence of recent camping on the concrete is apparent. 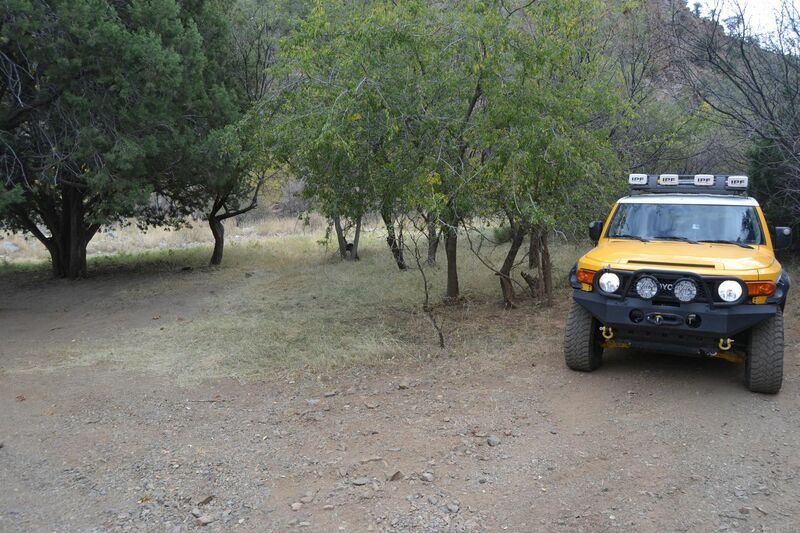 This is a relatively flat, very heavily forested area near a deep wash which you will have to cross. 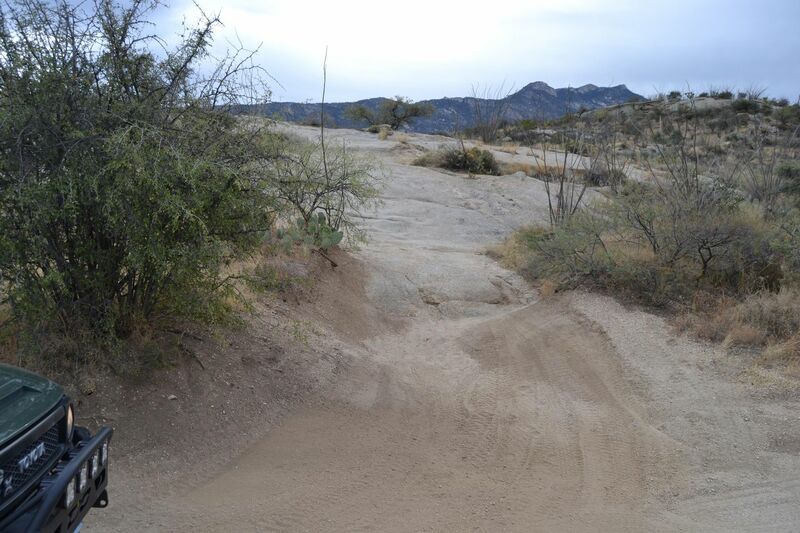 The road down from Coronado Camp's ruins has eroded out along the wash bank. 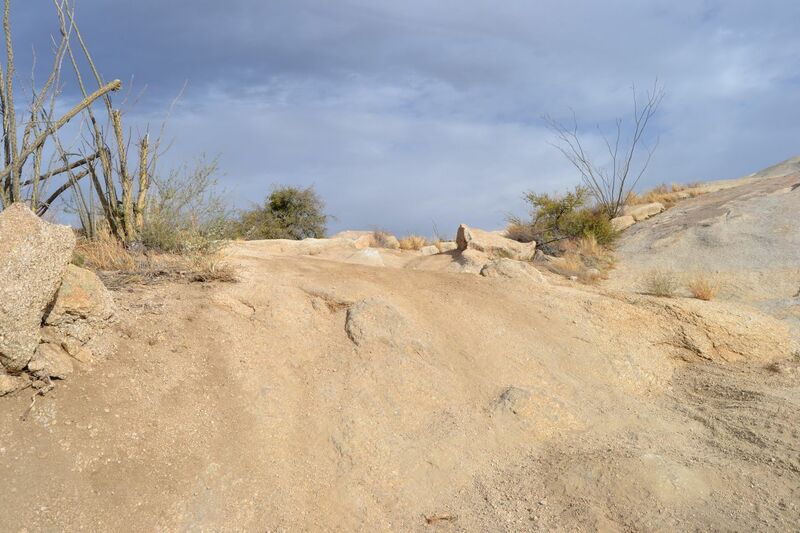 There are two lines (Each of which is doable) The one to the right involves a pretty fair sized boulder scramble down, and the one to the left is a bit easier, but may still require a spotter assist. Stay left. (The wash bottom to the right leads to this obstacle). 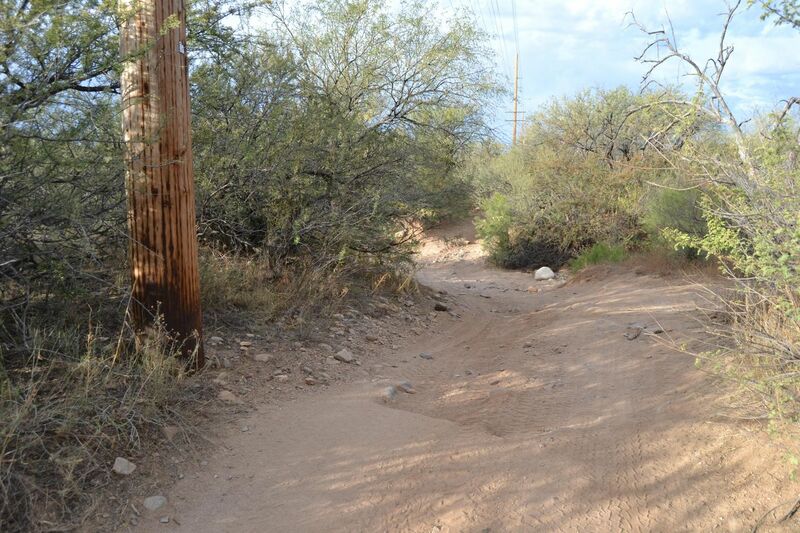 This is an entirely optional obstacle that isn't even on the main trail any longer. 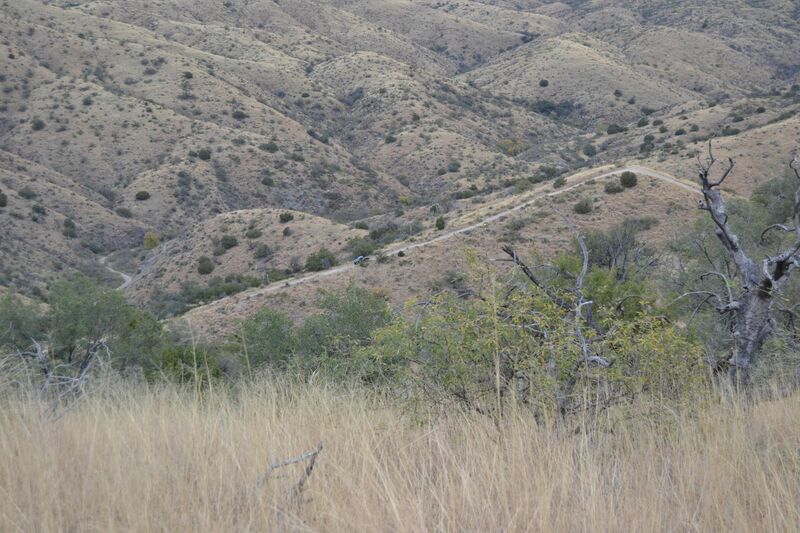 This is basically a 4-5' vertical climb, with some slight chance right and left lines that many would never attempt. 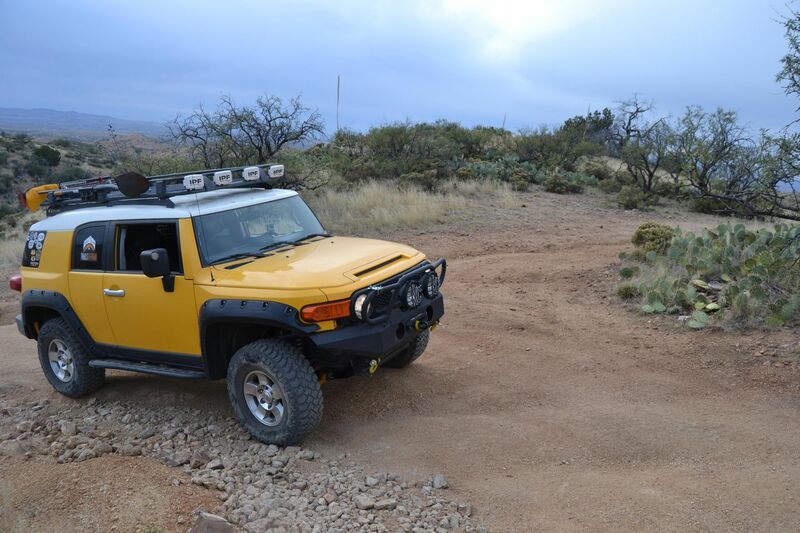 This is basically a highly modified vehicle obstacle or even a rock buggy climb. To find it, after you reach the second part of the wash, take the right "Y". (It's only about 150 yards to the "Steps". The Main trail continues left at the "Y". 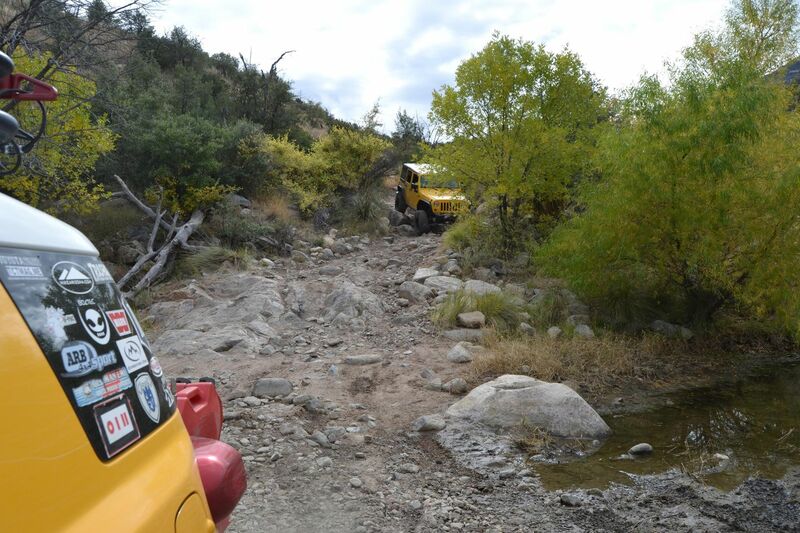 Damage is likely, and recovery, extremely difficult as you are about in the middle of the trail. Think hundreds of dollars for a tow truck in here. 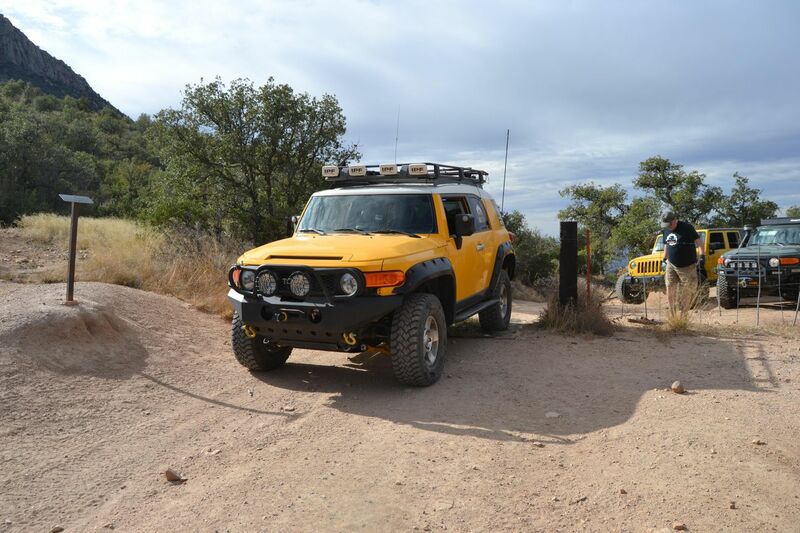 On a recent excursion, Three Toyota Tacoma's were traveling in Charouleau Gap, one blew out its differential on the "Step" obstacle. This vehicle was immobile and was towed out with a strap. 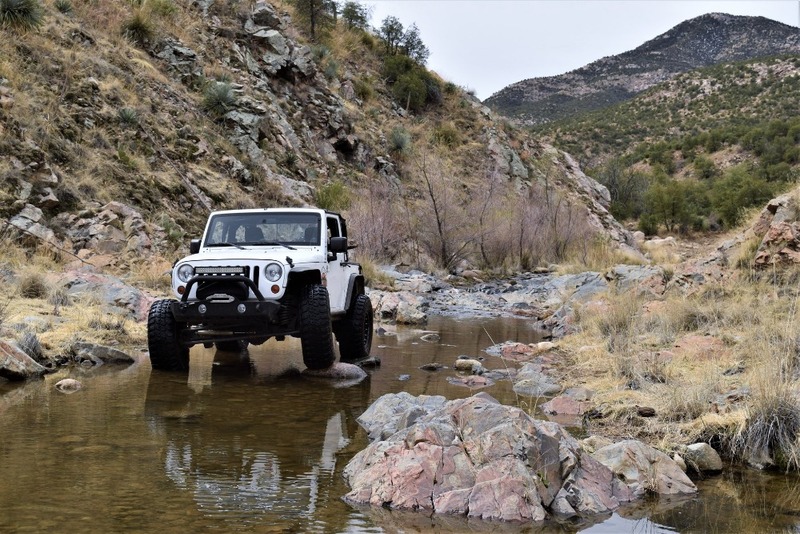 If you are alone, there is no cell service and if you could send for help, you could have real problems getting your rig out of here. 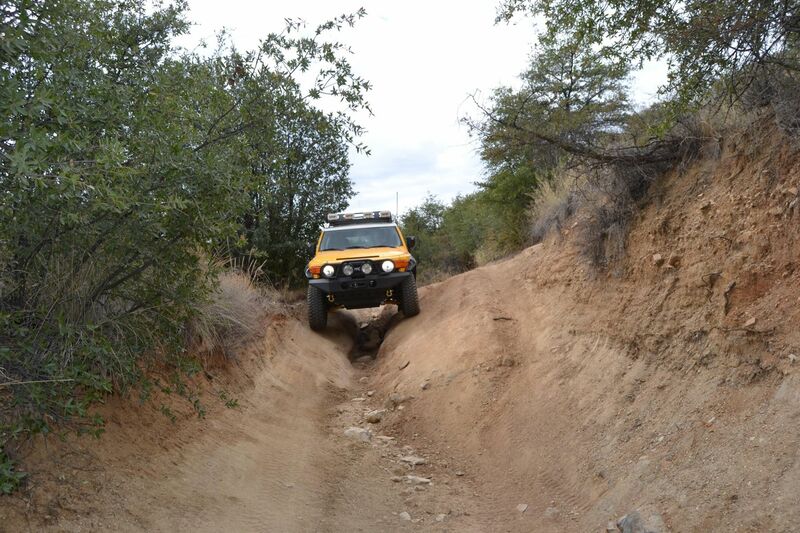 A good recommendation is for a solid axle setup or very long travel capability vehicle to attempt this. 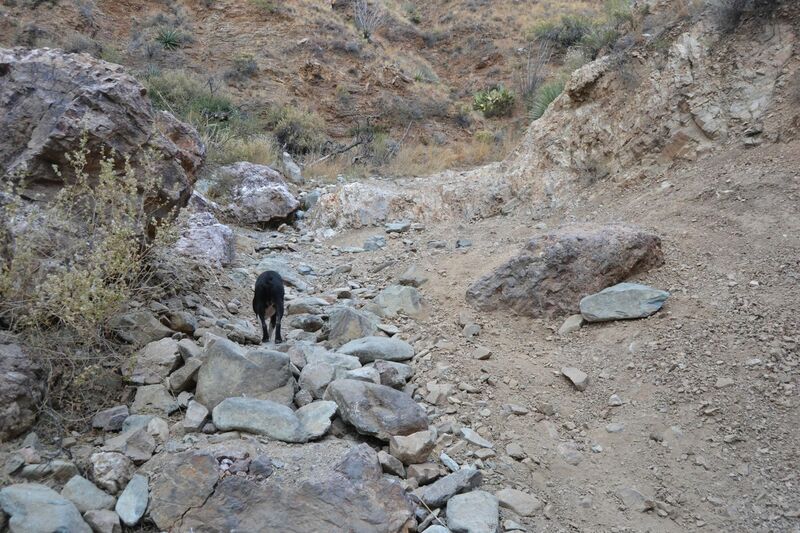 The wash continues to the north and rejoins the main trail. 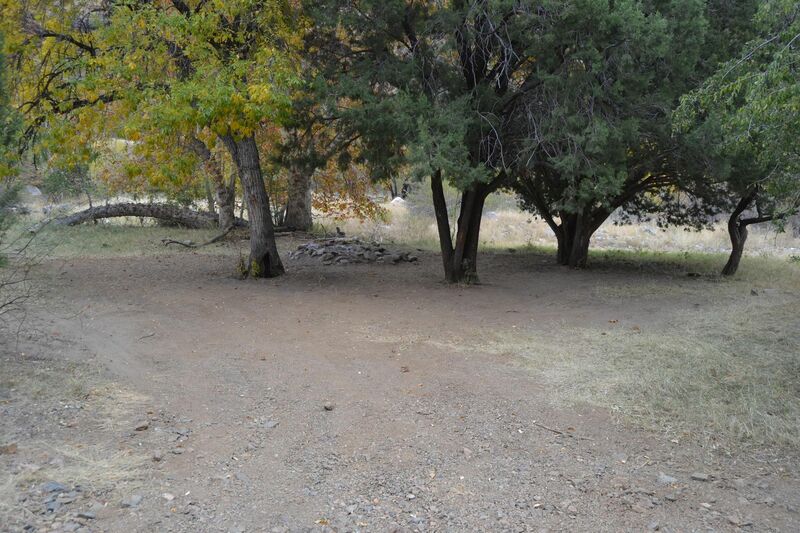 This has to be the best camp spot on this trail, a nice smooth flat shaded by oak tree area to the right along a wash. You could put 10-15 tents in here. 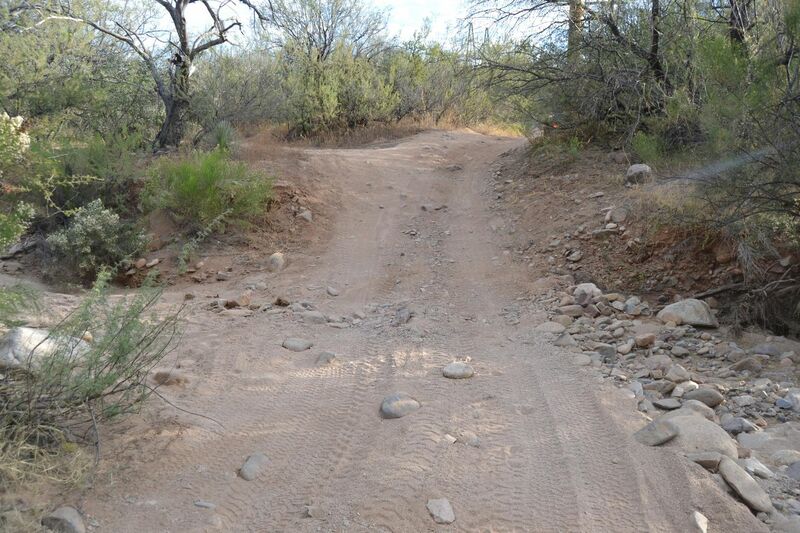 This is the most complicated obstacle on the trail. It actually starts about 150' back from the tight 90 degree S turn. It is quite a bit more washed out than other parts of the Charouleau Gap Trail. 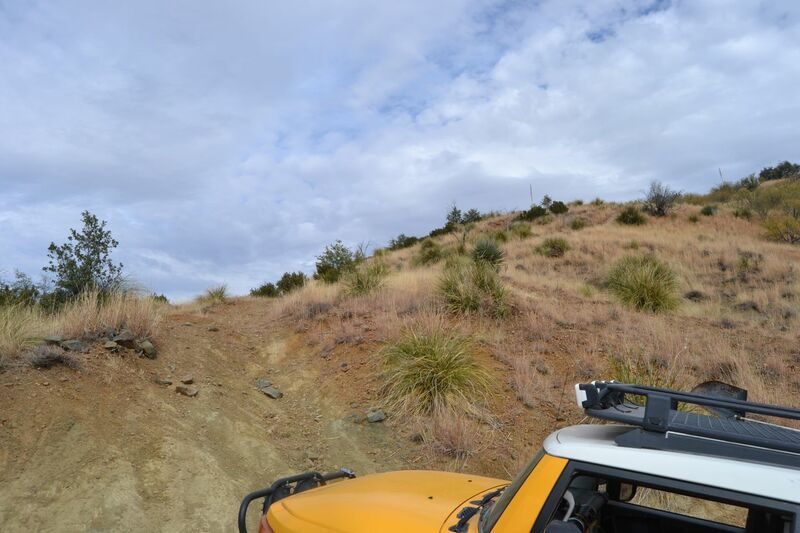 Basically, you begin by staying high left to get over the first rocky outcrop (Where you can be high centered pretty easily if you go too far right). 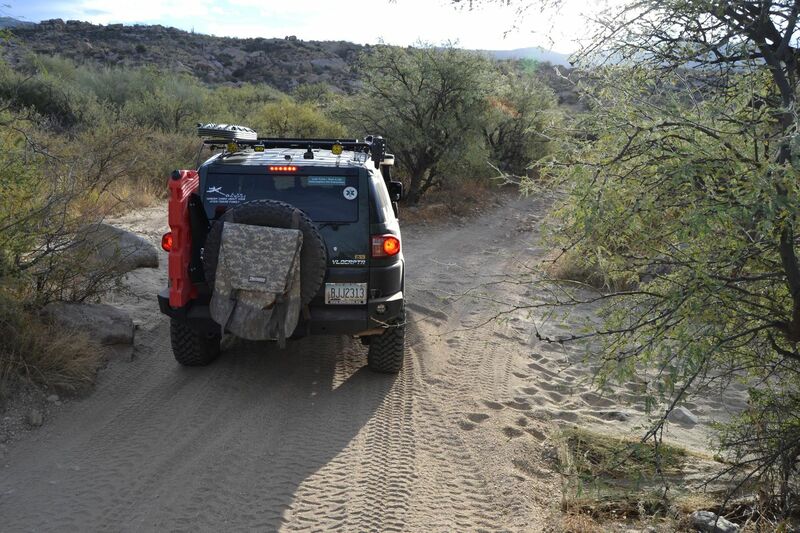 After you are past this rock (Which really isn't that hard) you are faced with a hard left turn and are confronted with two paths: To the left is loose scree that will slide the back end of your vehicle into the big boulder at the left. The true path is to take the right side, where you have to skirt around another boulder directly in the middle of the trail. 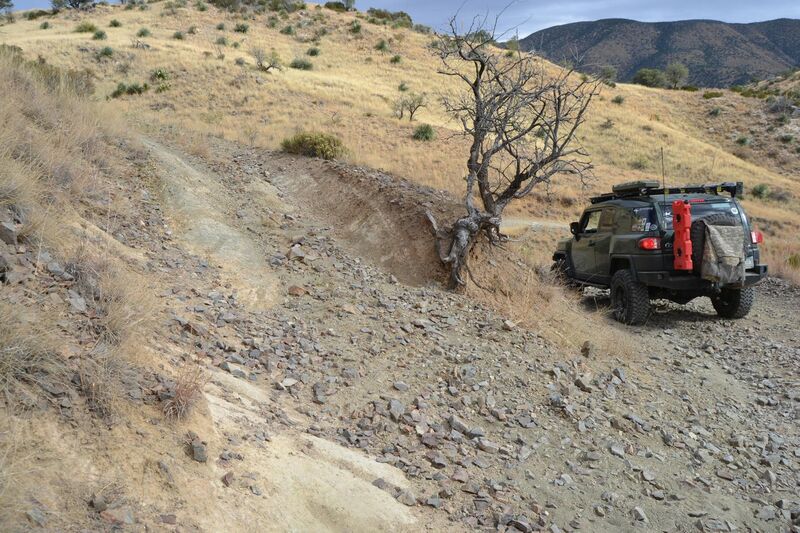 To the right, is a severe off-camber dirt wall that you must drive on around the rock in the middle of the trail. Then you are faced with a 3' shelf to climb. At one time there was a tree at the end that you could winch against, but it's long since been pulled out of the ground so no help there. 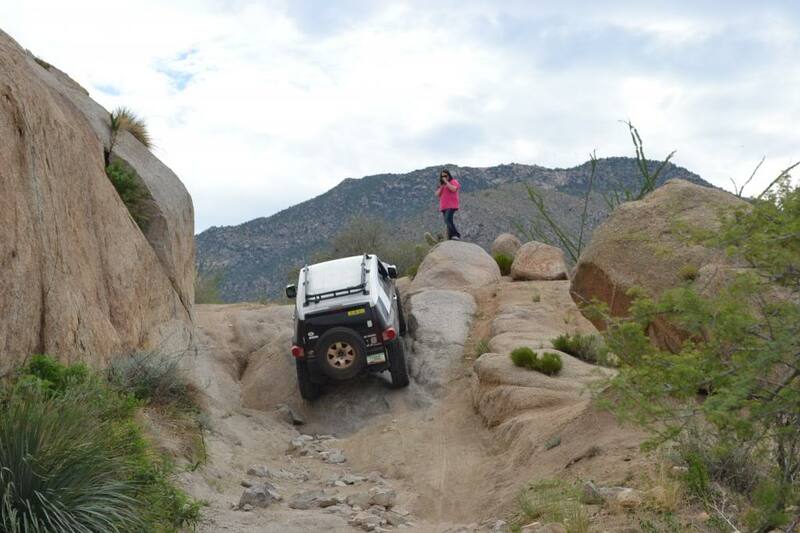 This obstacle is probably the main reason you don't want to do this trail alone, as a spotter is highly recommended here. 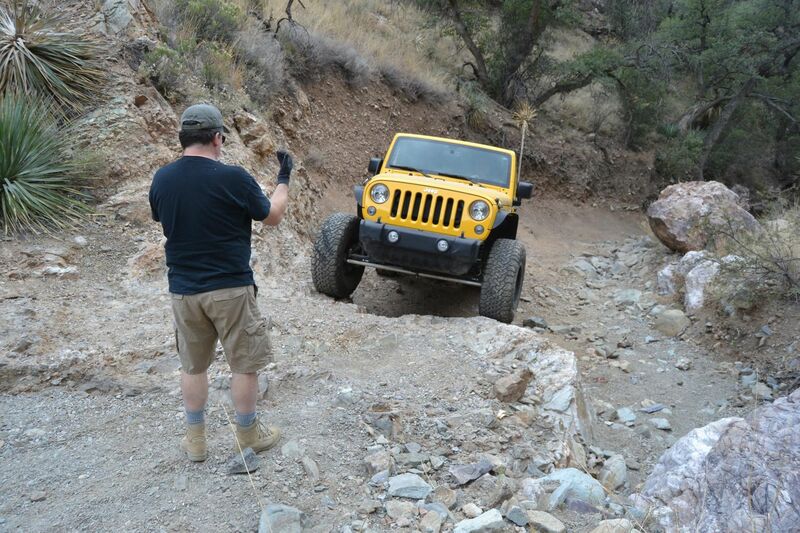 Immediately after the "Bumper Eater" obstacle, you must climb a 75' high hill that is deeply washed out. 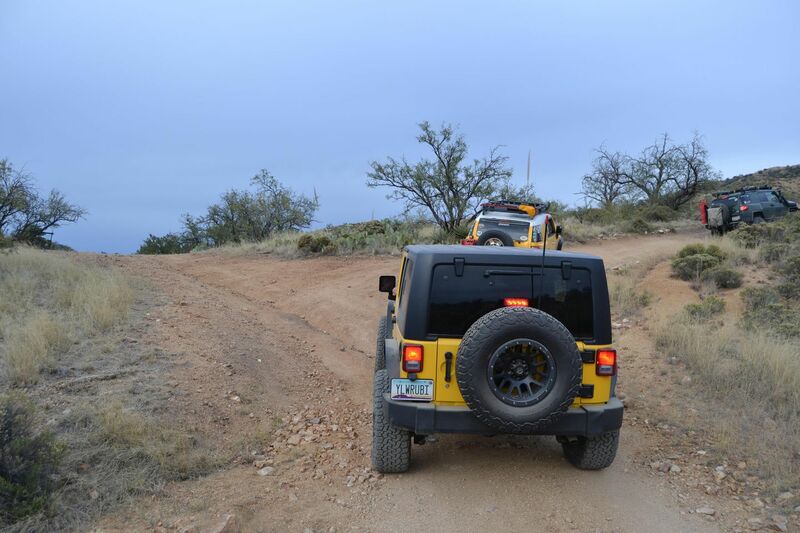 About 80% of the way up the hill, a passenger tire can drop into the "V" and flip a vehicle onto to the passenger side. It may save body panel damage to use a spotter at the top of the hill, (Which is quite significant in height) ROLLOVER DANGER: The road at the top to the left is FR#4491, which leads to a bunch of mining activity off to the west. Continue straight. 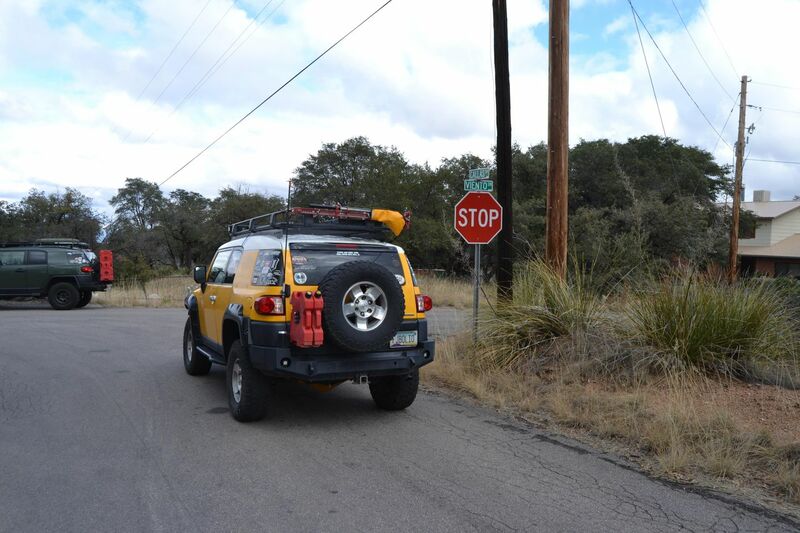 Just another Forest Service road to the right that leads off to Burn Tank (FS#737). 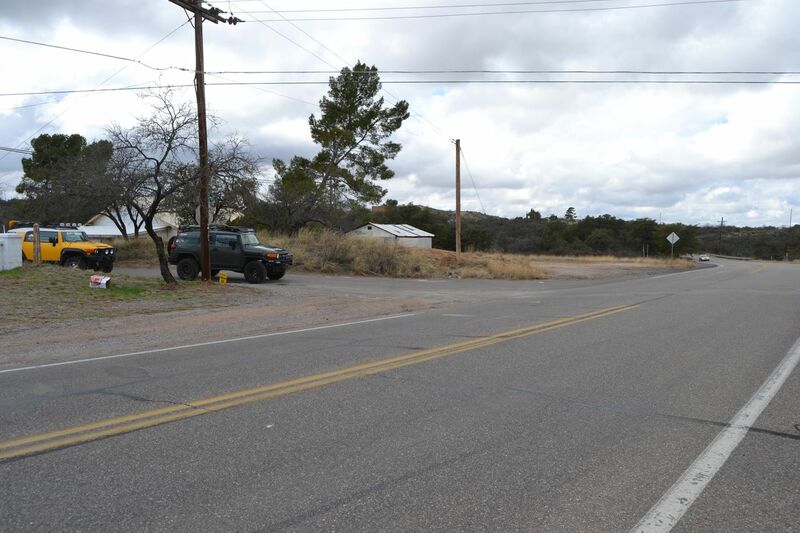 There is an FR#736 sign on the right side of the road just before you come to this intersection. Stay to the right side. Tire placement is very important. 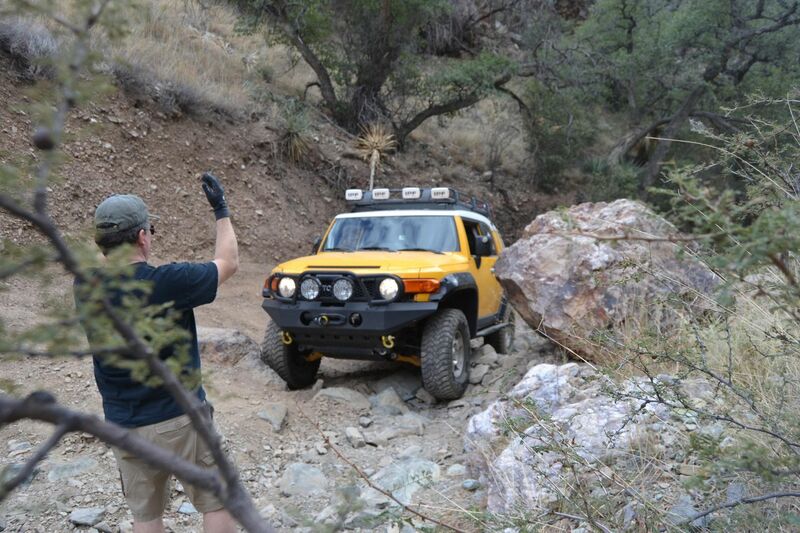 This is a rocky hill climb immediately across a small wash. If you have a locker, this might be the place to use it. The line to take is to the far right (counterintuitively up the rock face)- Then up to the left after climbing the initial 20'. 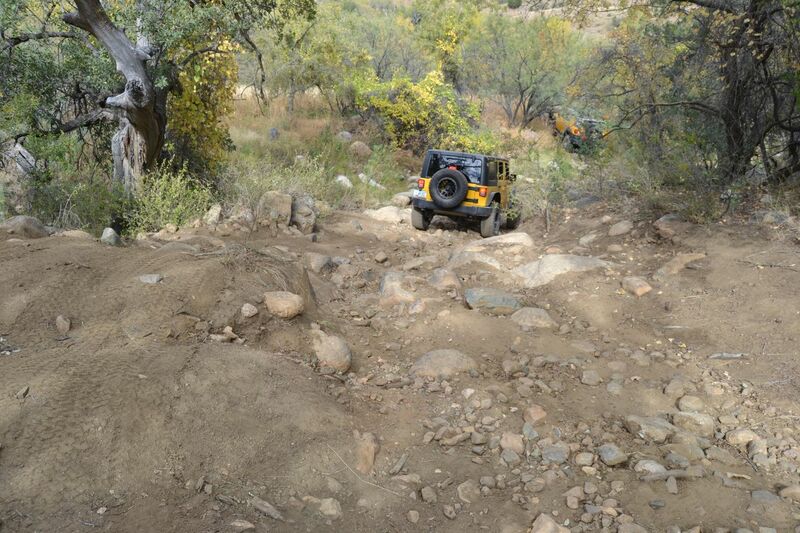 This is a challenging obstacle/hill climb and if you try to go up the left side at the beginning, you cross a very deep wash crossing and the rollover danger is very real. If you are unsure of how to tackle this, ask for a spotter to guide you. 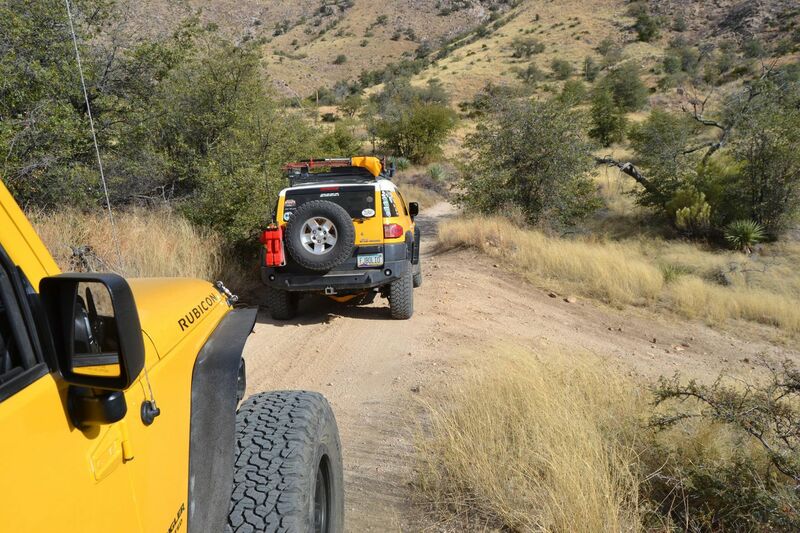 ROLLOVER DANGER: About 9:10 into this video is documentary evidence of this danger. At the top of this Hill to the left is FR#4488 which eventually leads you to the University of Arizona Biosphere II campus. 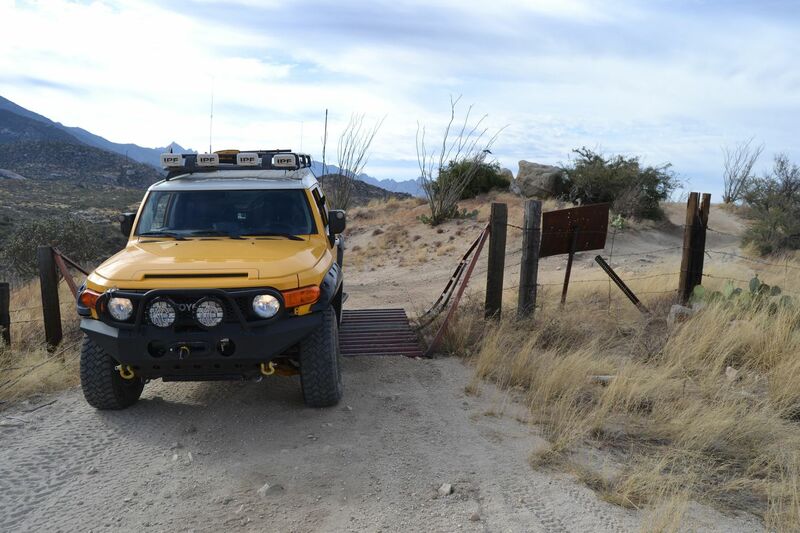 This gate, which is a seemingly odd spot at the crest of a ridge after you negotiate some tight switchbacks, is normally closed. 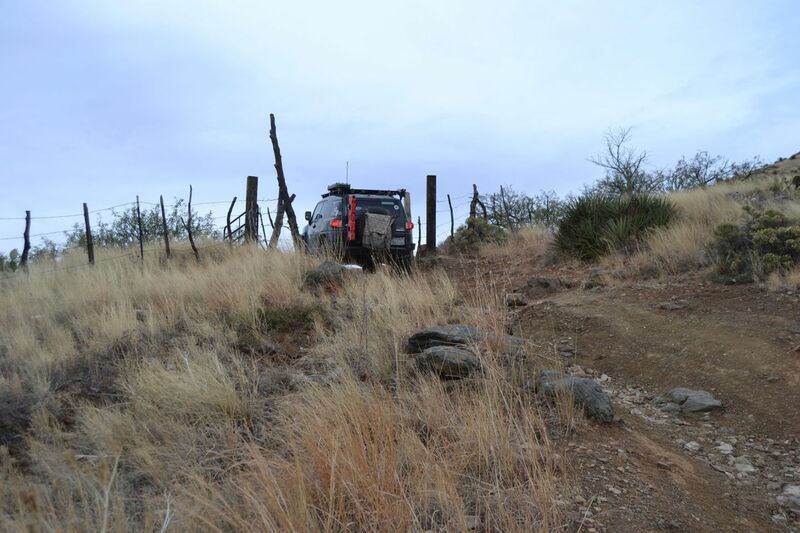 Be careful with your footing up here when you debark to open /close the gate, it's steep terrain with some loose scree. This gate is normally closed, please leave it that way after you pass. Another signature obstacle on the Charouleau Gap trail is the "Escalator" (Sometimes referred to as the "Elevator"). 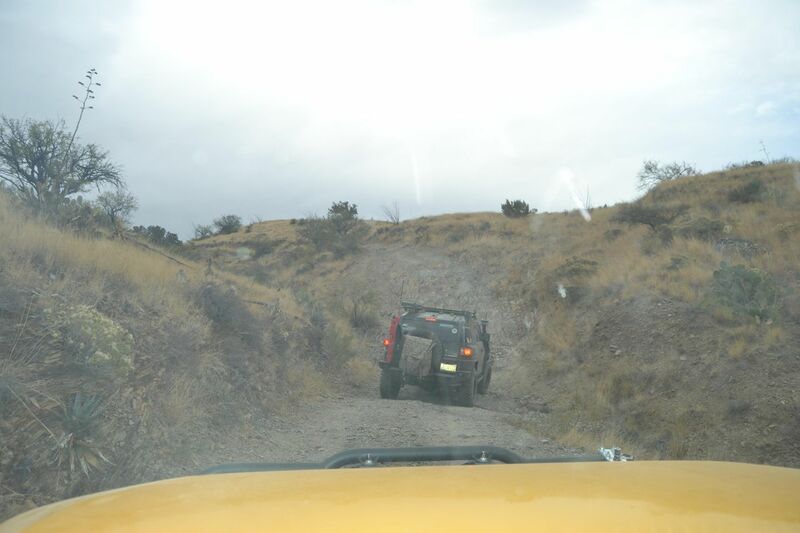 A very steep hill that descends 600 feet in 0.3 of a mile. Expect a 30% down bubble on your inclinometer. 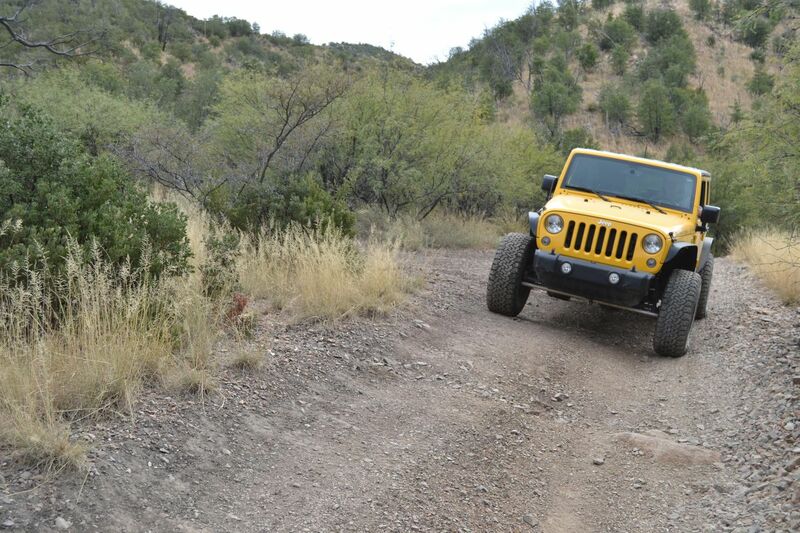 Be sure your brakes are in good shape. A better technique is to drop into 1st gear low transfer and use the engine as a brake. 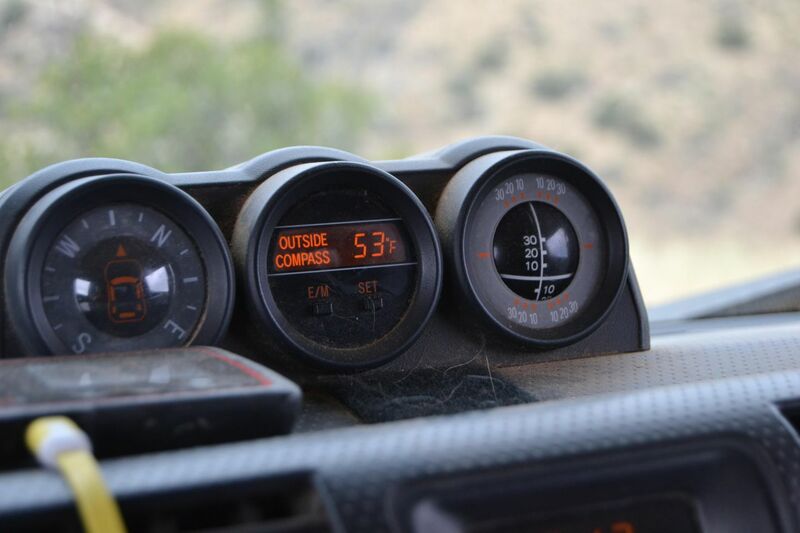 It will still be a tad unnerving as your engine RPMs climb ferociously. 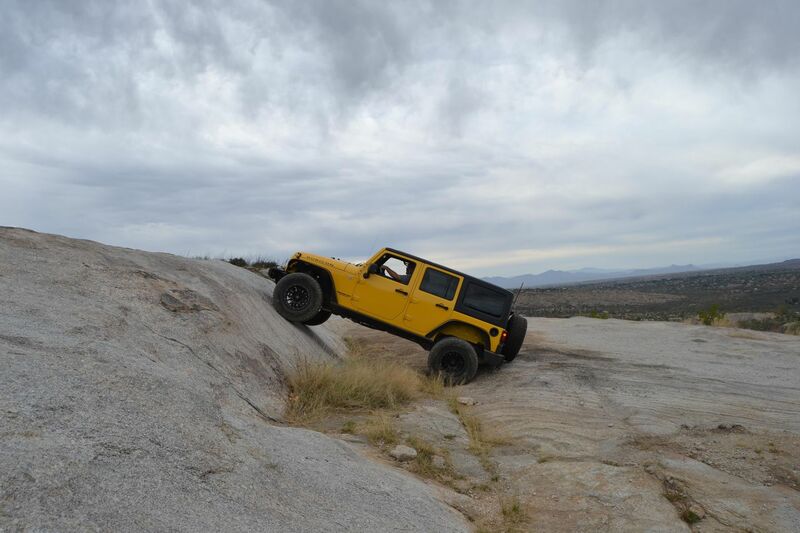 For some, pucker factor may be high. You made it. But now there's a three-way fork to deal with!. 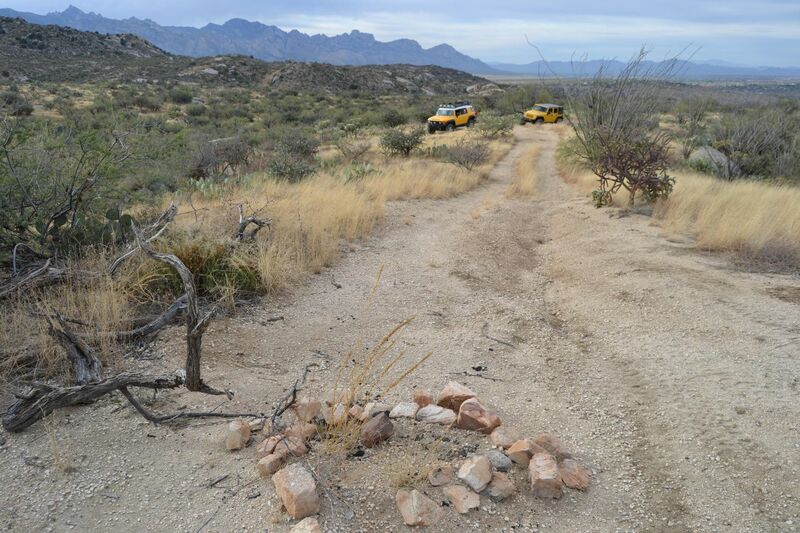 FR# 7705 crosses here (Though the topo only shows it going to the right) in the Dodge Wash. Continue Straight on FR#736 and you will start to climb out of the bottom. 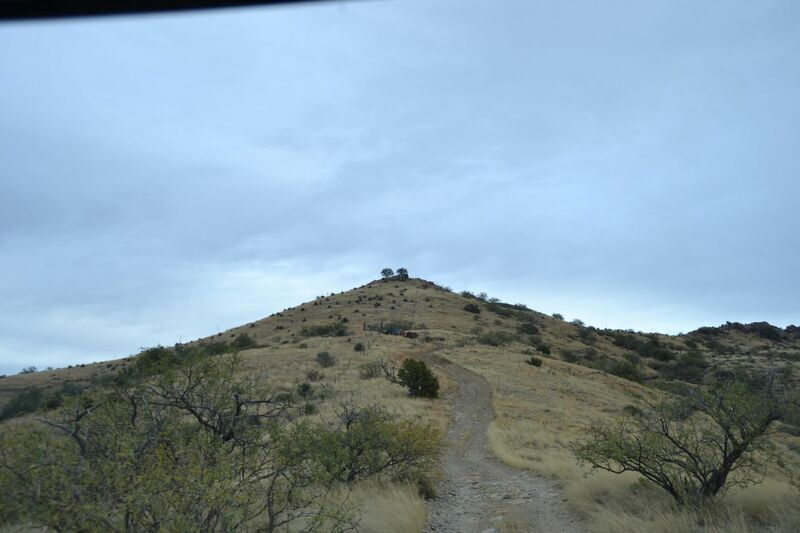 As you climb, look back over your shoulder at the amazing hill you just descended. (Or, if you are coming this way, lament at the giant hill you are about to climb). Stay Right. 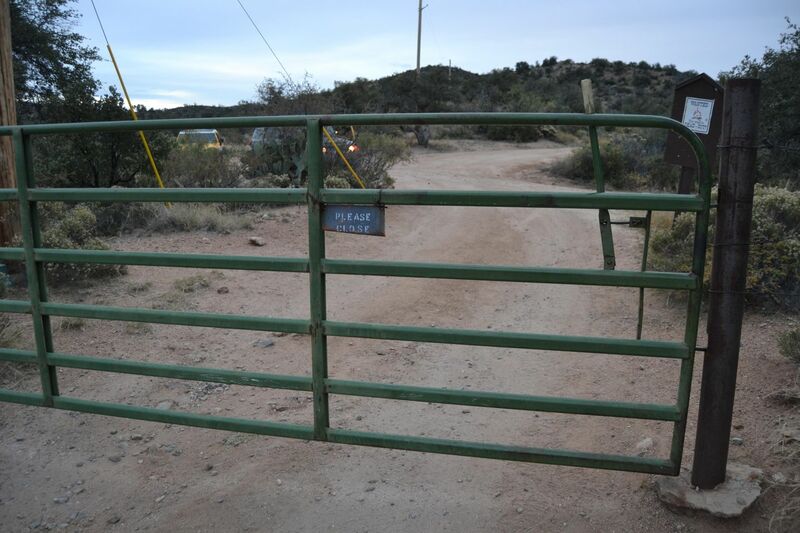 There is a closed gate here, leading to a road that shortcuts FR#736 a short distance. It's much straighter, but considerably rougher. By this point, you'll be happy to stay on FR#736. Stay right. 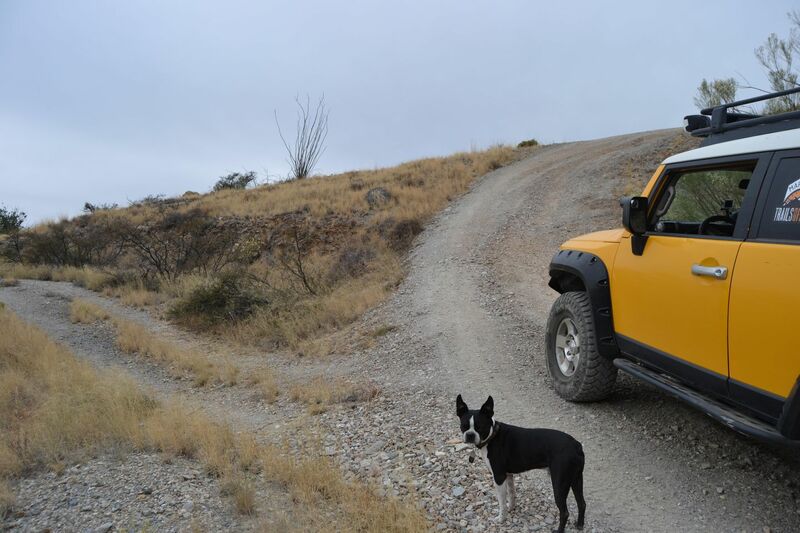 Just before you descend into the Irene Wash (where a windmill will be on your right) there is a road that leads up a hill. 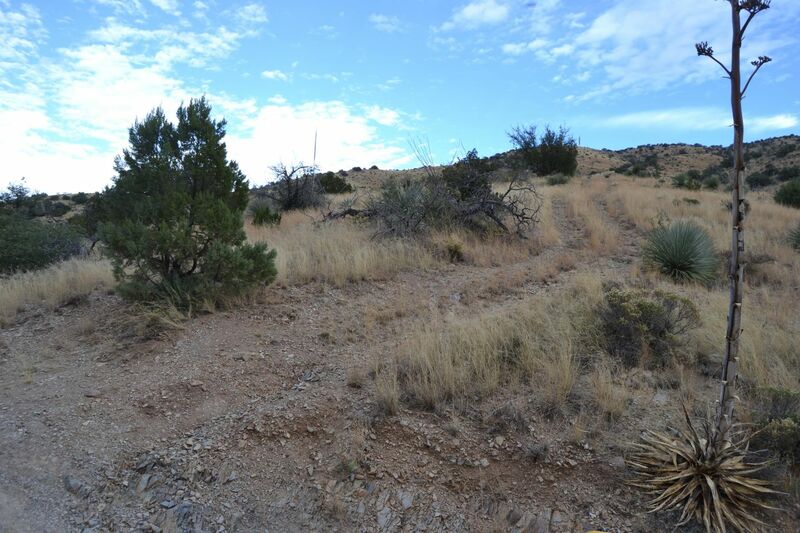 This is likely a dead end just up to the hilltop as it is not shown on the topo. Stay right, A nondescript road that looks like a two track leads off to the left. This may be a short cut to the town of Oracle, it's terminus does not show on the topo map. 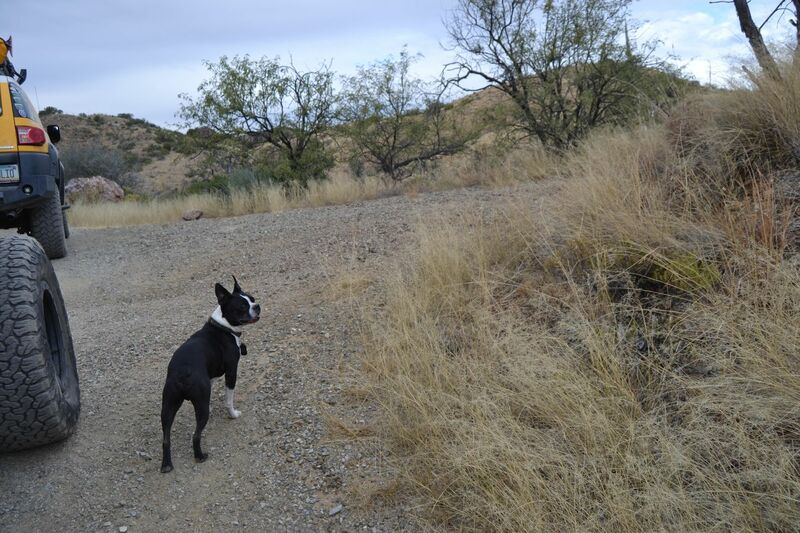 you are climbing along the edge of Oracle Hill here (on your right). 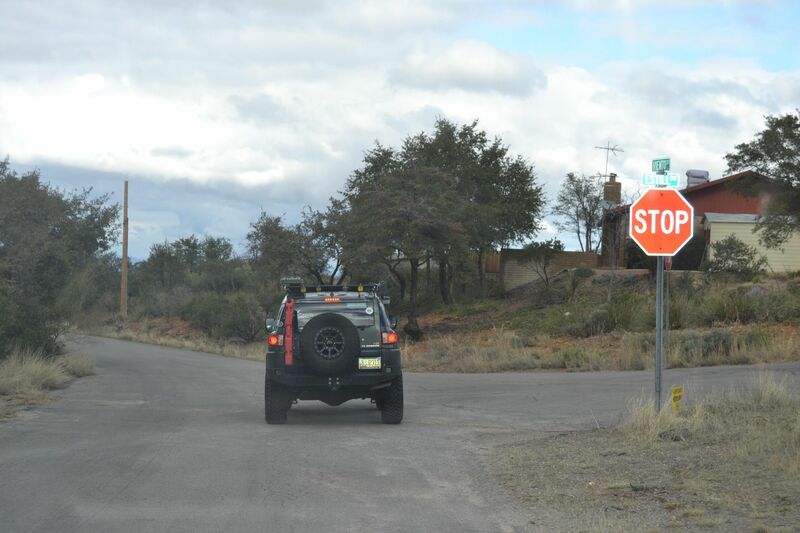 Stay right, The gate at this intersection is normally closed, please close the gate once you have passed it. To the left is a shortcut that leads out to the Oracle water tank. To the right is the continuation of FR#736 that leads to the air up spot. Make a left turn here - Straight ahead leads to FR#4487 toward the San Pedro River valley. There is a large metal sign placed by the Tucson Roughriders here. 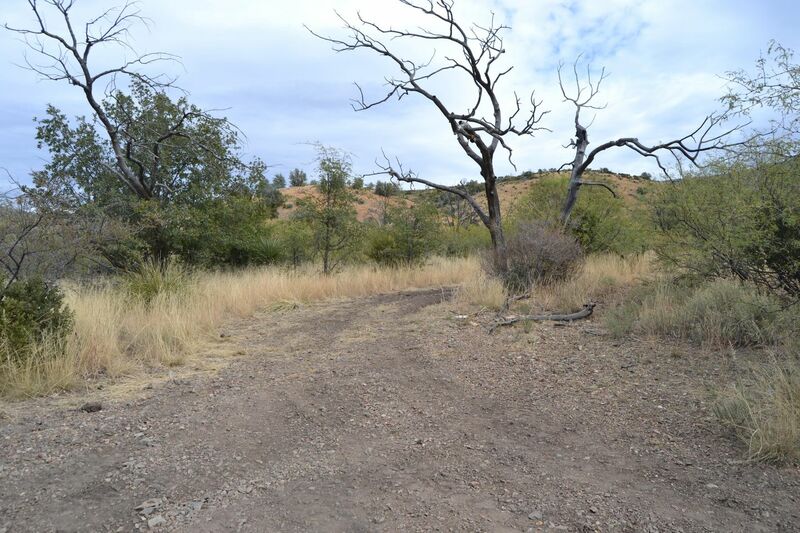 About a 1/2 acre, open dirt area awaits at the end of the trail. This is where you would air back up because on the other side of the gate is pavement. 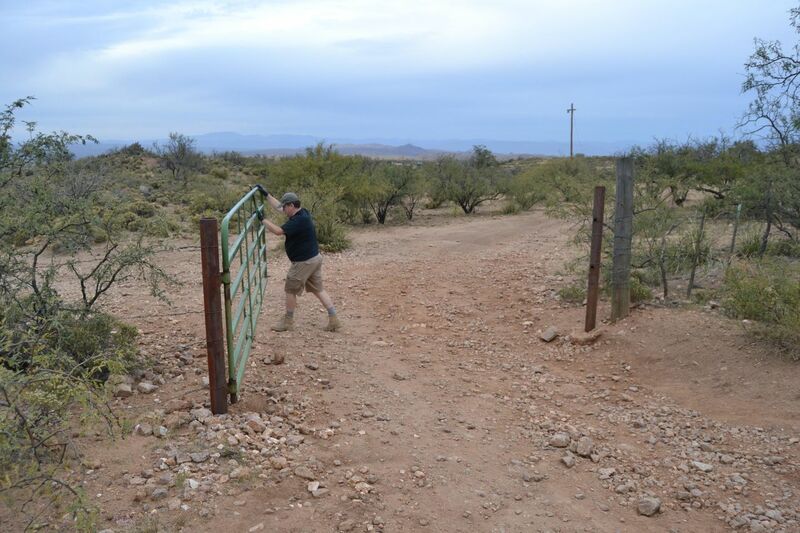 This gate is normally closed, please close the gate upon your exit from the Charouleu Gap trail. 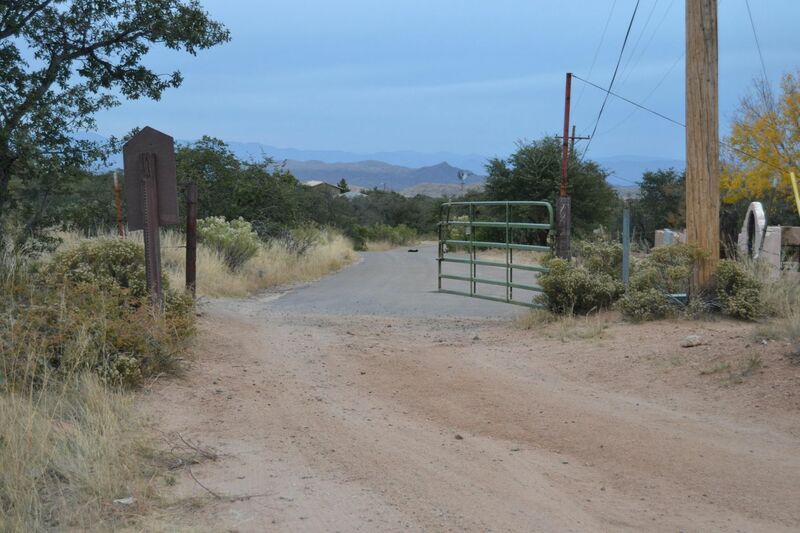 Close the gate and head north for about 1 10th of a mile to the intersection of Callas Drive (Charouleau Gap Road) and North Viento Drive. Turn left here at the "T" onto North Viento Drive. This is an interesting 4 street intersection that presents as a three-fingered fork when going south. The roads are North Viento Drive, North Estill Drive and East Nuestro Street (Which you won't be on). If you stay left, the road becomes North Estill Drive. Turn left. This is a "T" intersection at East Maplewood Street. 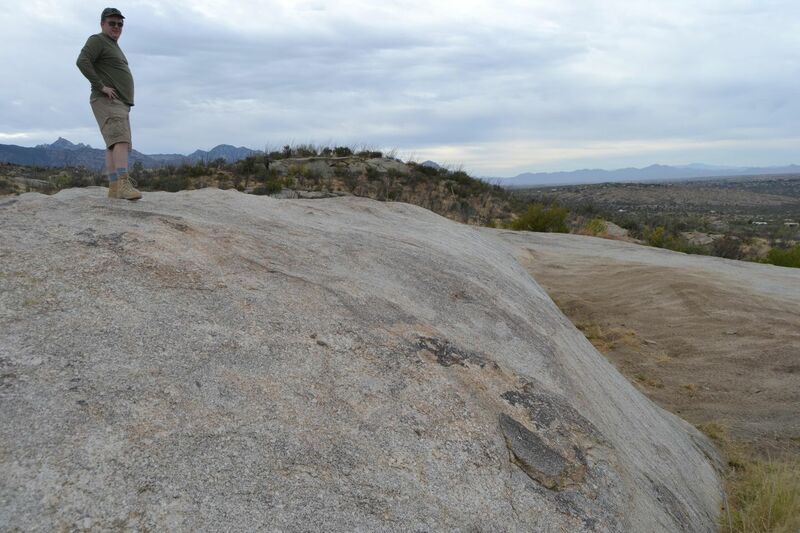 You will know you are in the right place when you see the big granite rock, typical of many others in Oracle. Turn left here for about 100 yards. Turn right, After about 100 yards, East Maplewood Street ends at a 90-degree bend to the right. 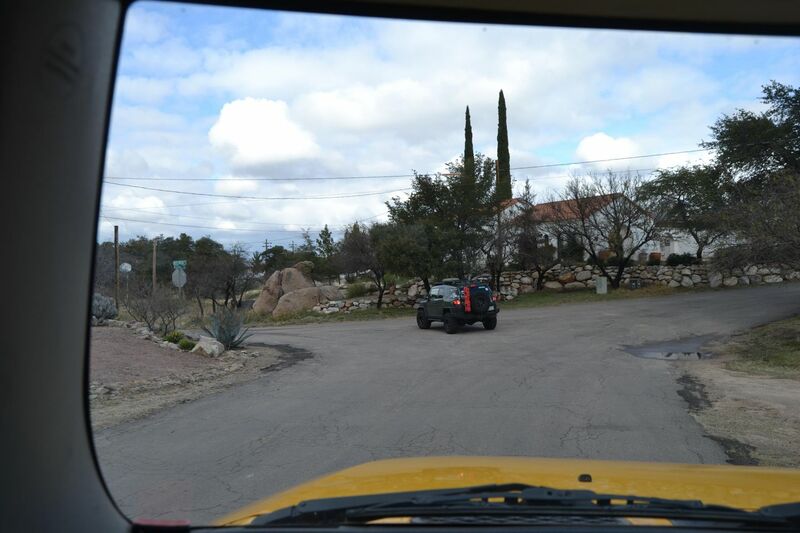 There is a road to the southwest shown on the topo map but that is just a private driveway. Turn right onto North College Drive to the final waypoint. This is the "T" connection with North College Drive and West American Way. There is a large white church here as a landmark. 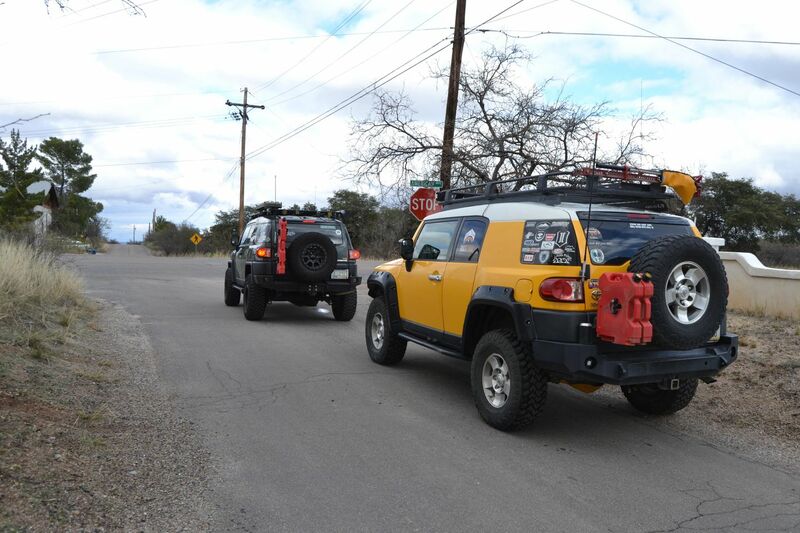 To the right will take you to the Mount Lemmon Control Road, or alternatively, through Oracle back to Highway 77. 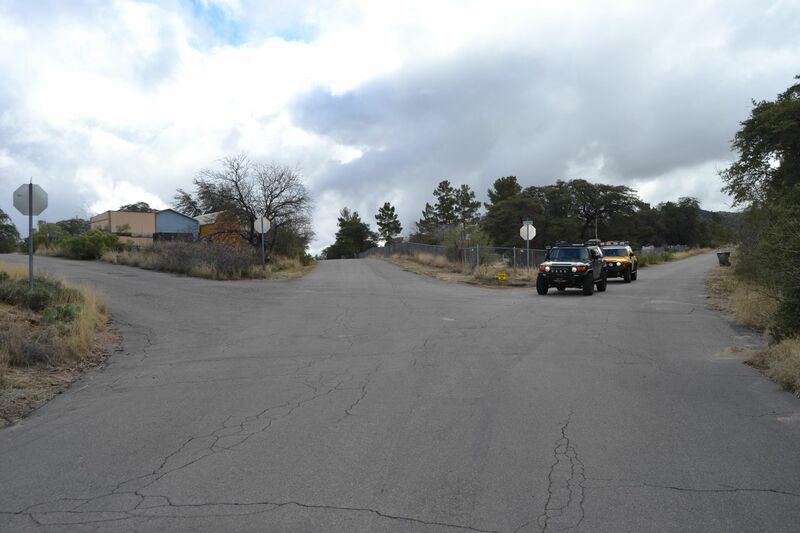 To the left, will return to some convenience stores for fuel and Highway 77. (Yes American Way intersects Highway 77 twice). 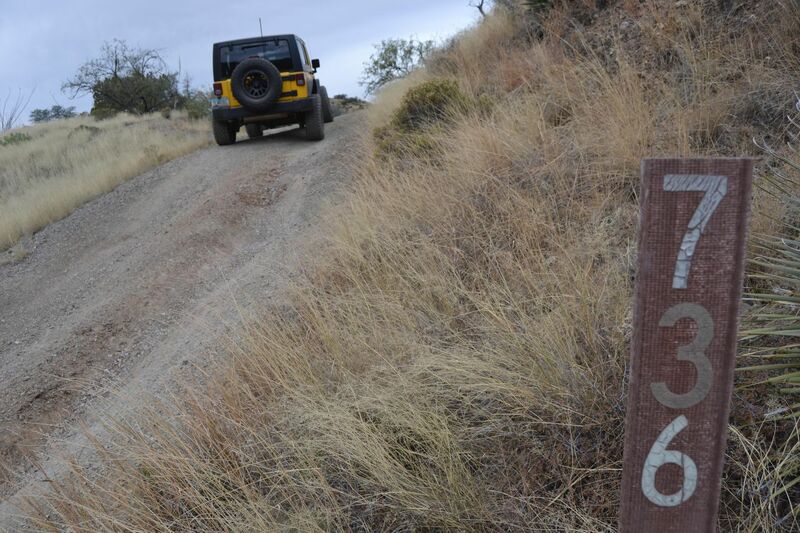 From Tucson take Oracle Rd North/Northwest to Golder ranch rd, set your odometer to 0.0 here. (Note, all mileages are measured from this spot). 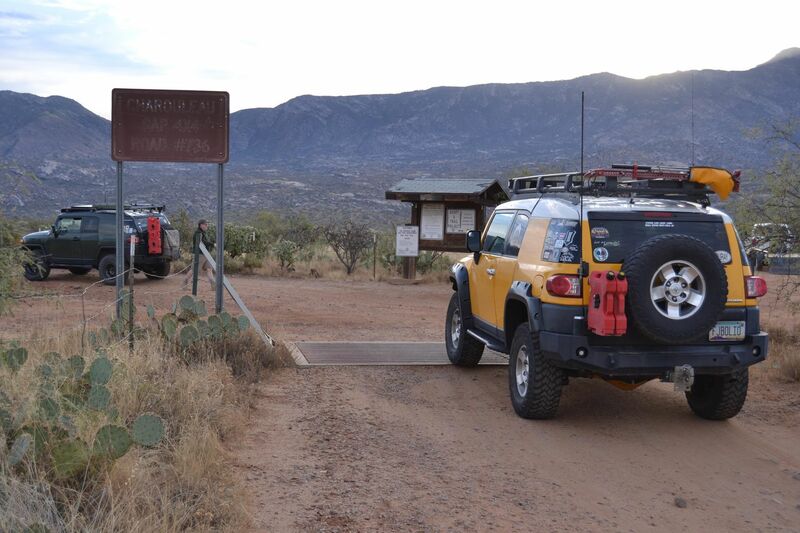 This is not the actual trailhead but it is a very convenient place to designate as a gathering point for a group ready to traverse the Gap. 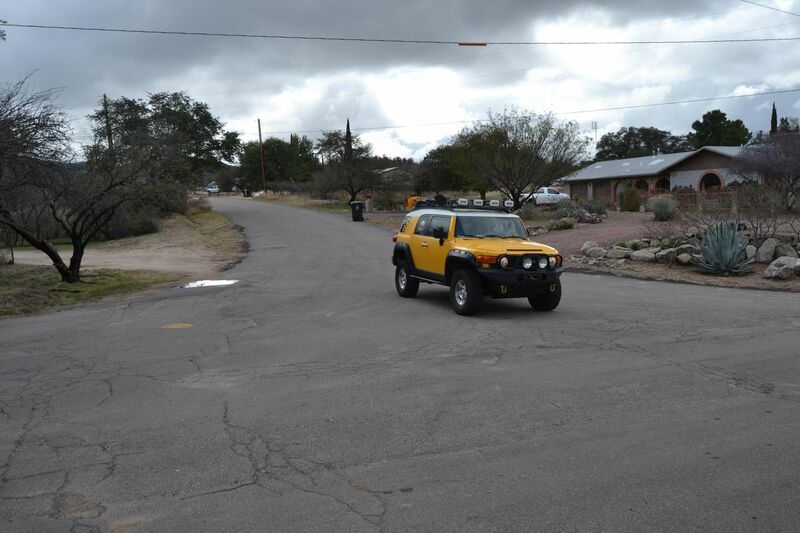 You will find your last opportunity for gas and snacks at the Valero, and a Basha's supermarket to get more substantial supplies, like lunches, wood, etc. Proceed East until Lago Del Oro Blvd then make a left turn. 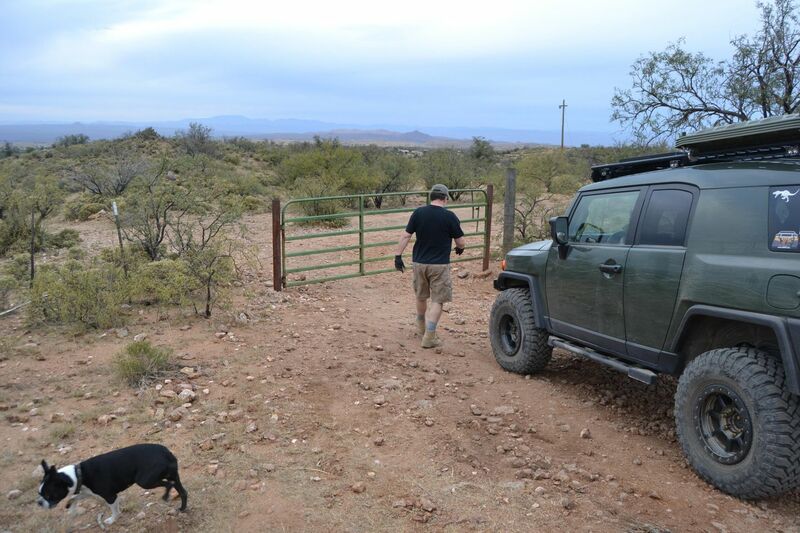 Head North for 4.3 miles to the trailhead on right at the cattle guard. There is a sign in kiosk and information board here. 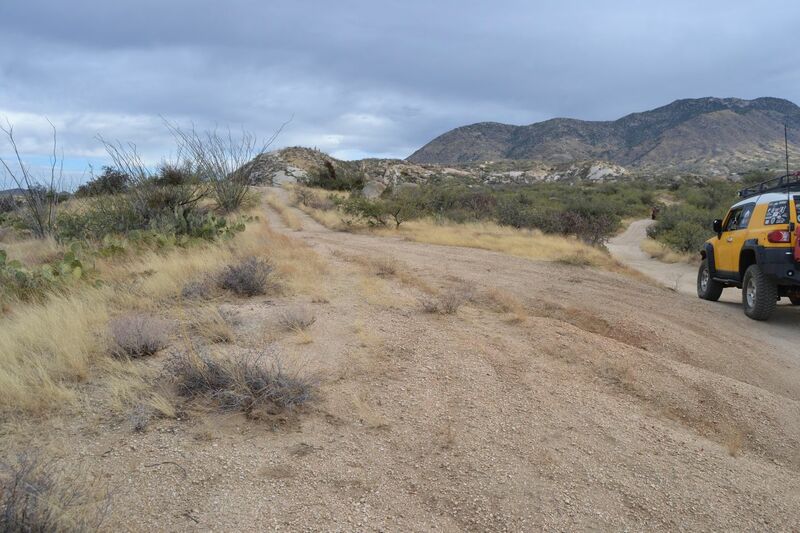 Catalina State Park is close to the Catalina trail head/end. 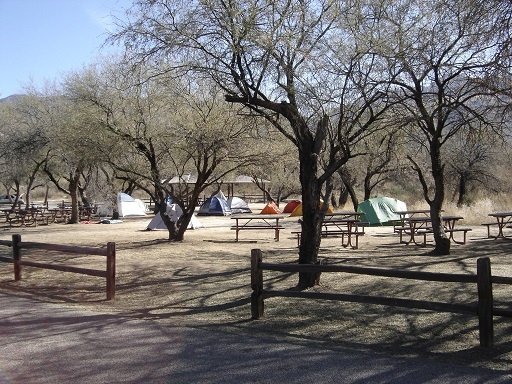 Tent and RV sites are available. 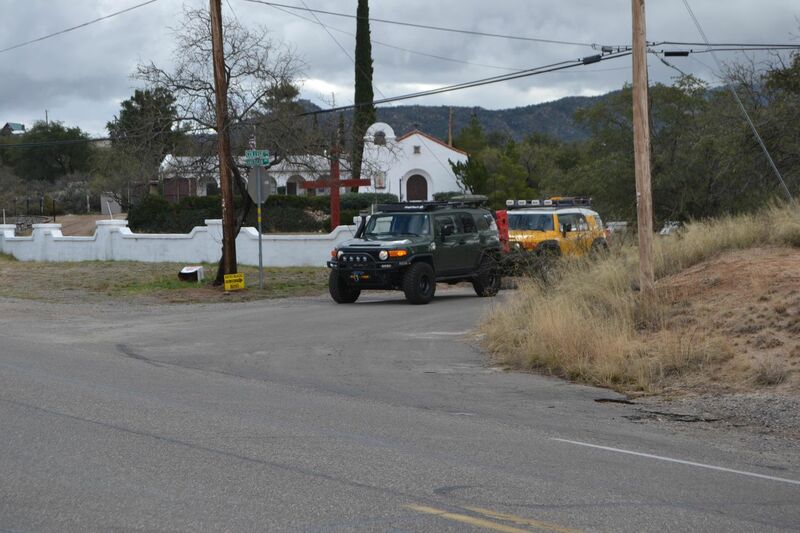 Many hotels and resorts are near this area as well in Tucson along Oracle Road. 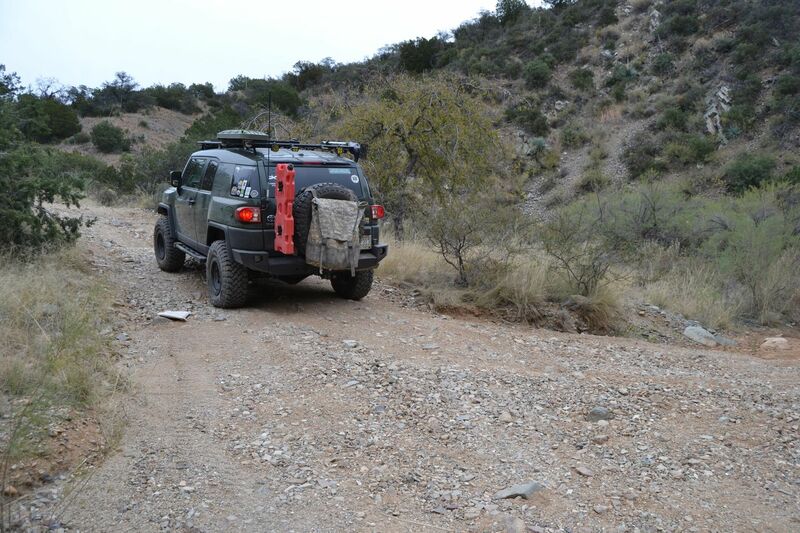 There are some dispersed camp spots along the trail. 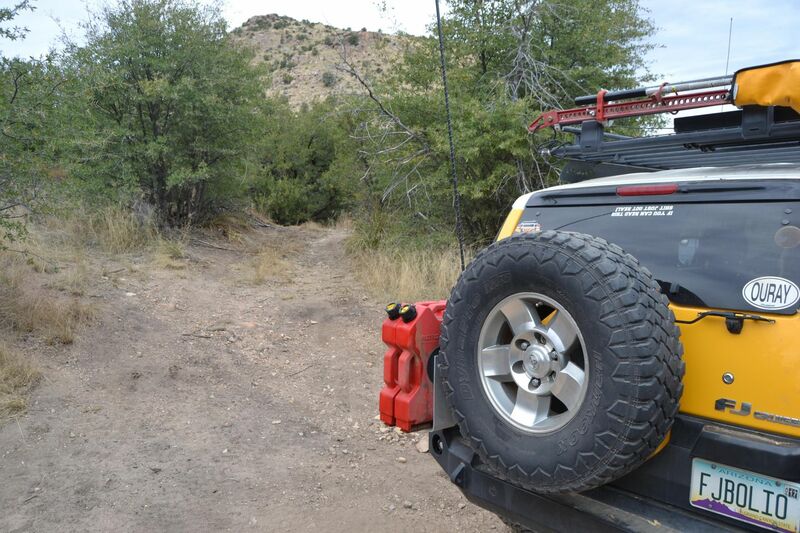 You can find small places to pitch your tent at waypoints. 9, 14,15, 24 and 27. This trail is open year round, even when there is snow blanketing the pass. 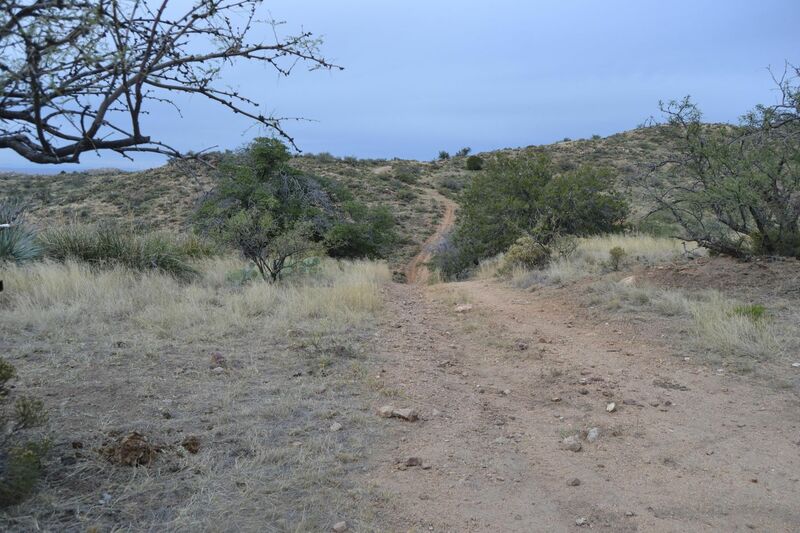 Though the majority of this trail is on Coronado National Forest, some of this trail crosses Arizona State Land so a permit is required. 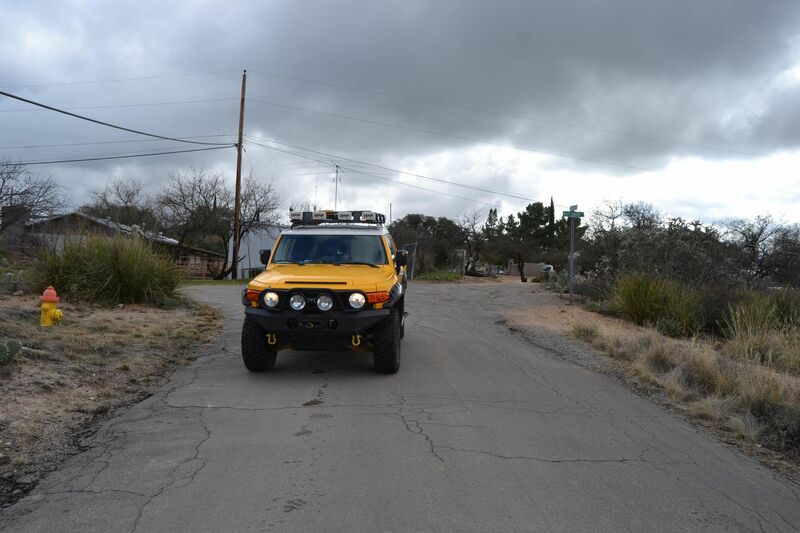 I moved to Arizona in 1984 and bought my first offroad vehicle the next year. 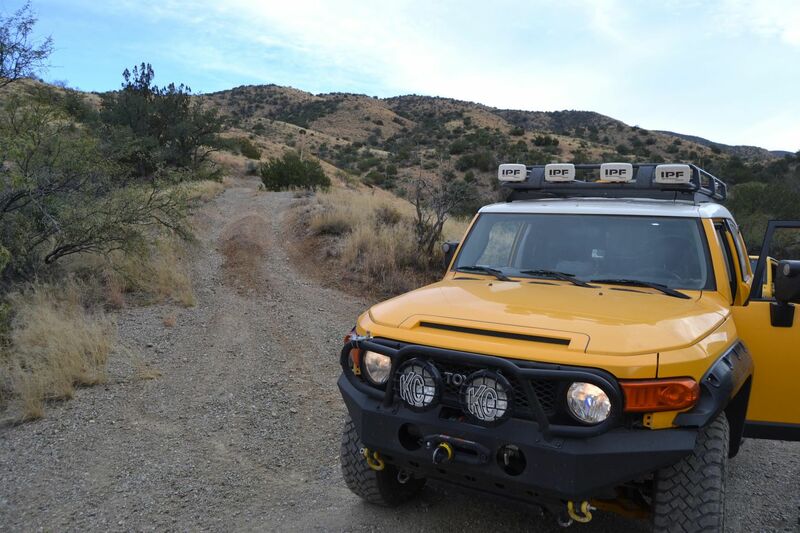 I had lots of adventures, seeking out the Old West on paper topo maps in my Toyota FJ40 and can say, fortunately, that I never had to walk home. 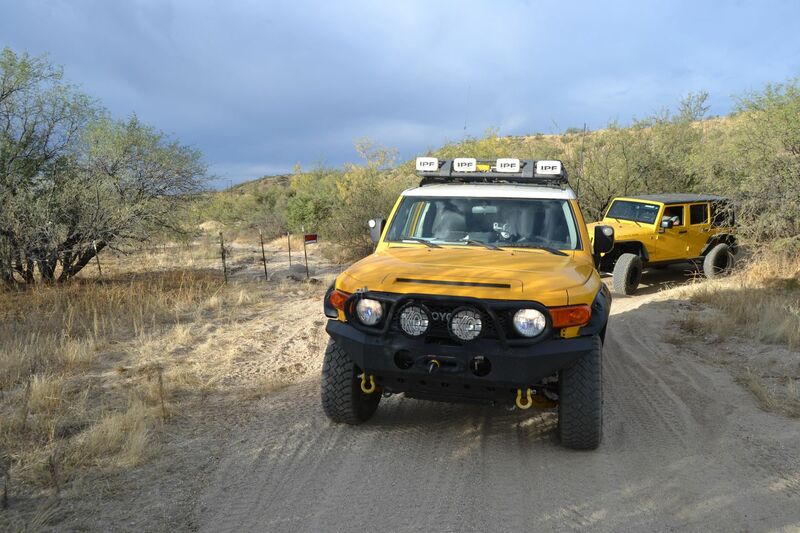 In 2005 I saw the prototype for the FJ Cruiser, and in the middle of my FJ40 resto project, someone came into my garage with cash and bought it out from under me. 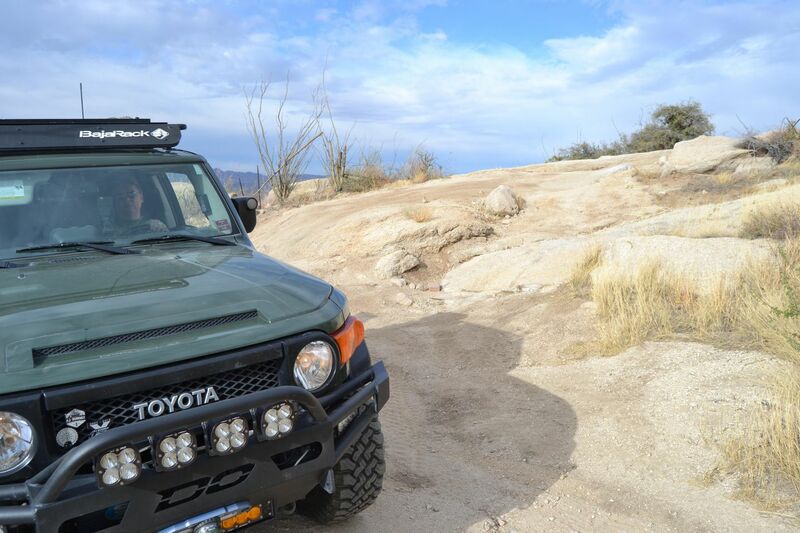 (Some regrets) In 2008, I flew out to LA to pick up my FJ Cruiser, special ordered with the Offroad Package (Locker) and MT6. 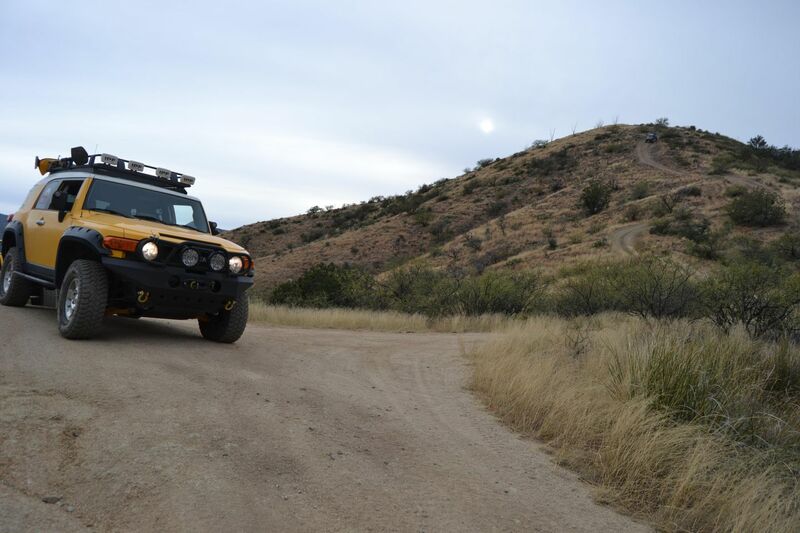 My area of operations has been Southern Arizona, from the New Mexico to California borders. 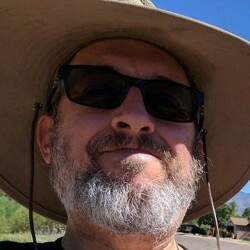 I have been an active member of AZFJ.org where I'm the top post contributor, and have many trail reviews posted there that I plan on enhancing, revisiting and documenting for this authoritative source. I have a login to Ih8Mud and fjcruiserforums but don't lurk there very much. in my career, I've had the pleasure of traveling in Canada, the Caribbean, and Australia but never had the opportunity to wheel there. (bucket list). 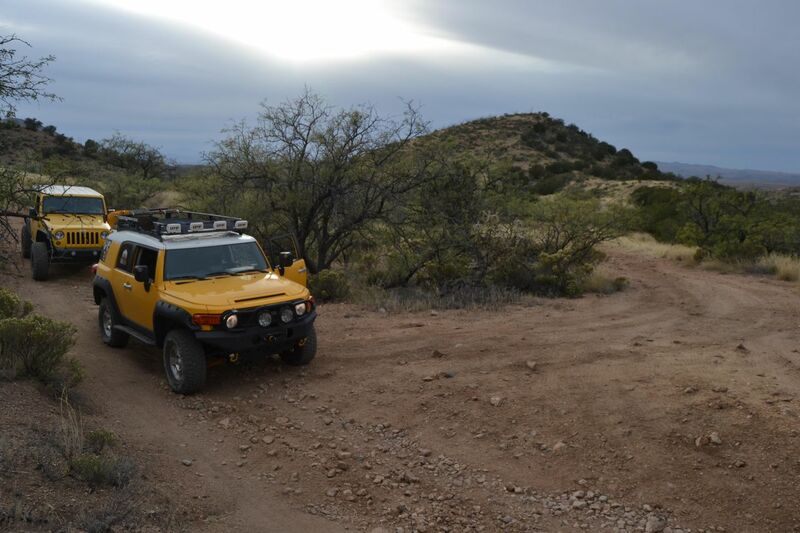 But, I hope my 30 years of Southern Arizona discovery, teaching and leading people into the backcountry will finally benefit a wider audience here on Trailsoffroad. There's nothing I enjoy more than finding a historic site, a little-used trail that had significance or the opportunity to take that one photo that defines what we do. (I stink but I'm willing to learn). Oh..Added benefit...I'm the GIS analyst for a fire dept and as such have some skills in ArcGIS. Q: Can a full size truck fit without body damage? Ram 2500 Power Wagon on 33s to be exact. A: The only place where you might have difficulty is waypoint 28. 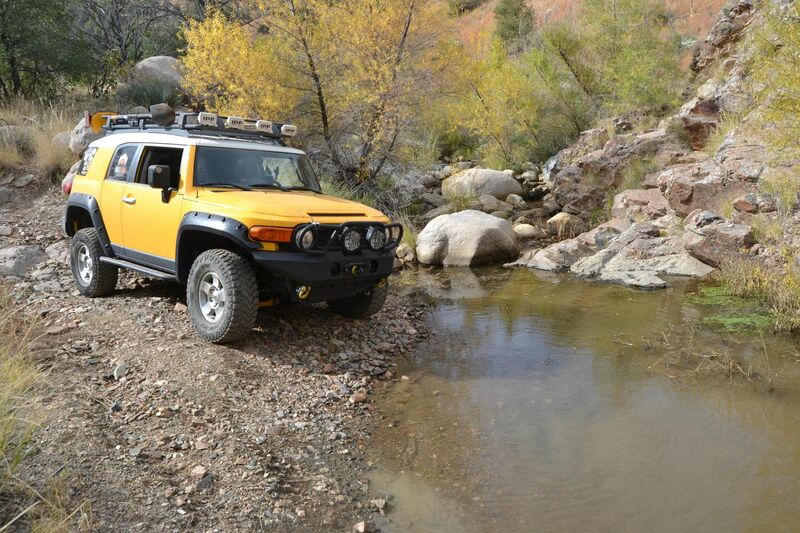 The bumper eater doesn't leave you much extra room on the right of the middle boulder. I got high centered on the boulder in the middle because I wasn't high enough up the right side wall. The rest I'm sure you'll do fine if you have a locker. 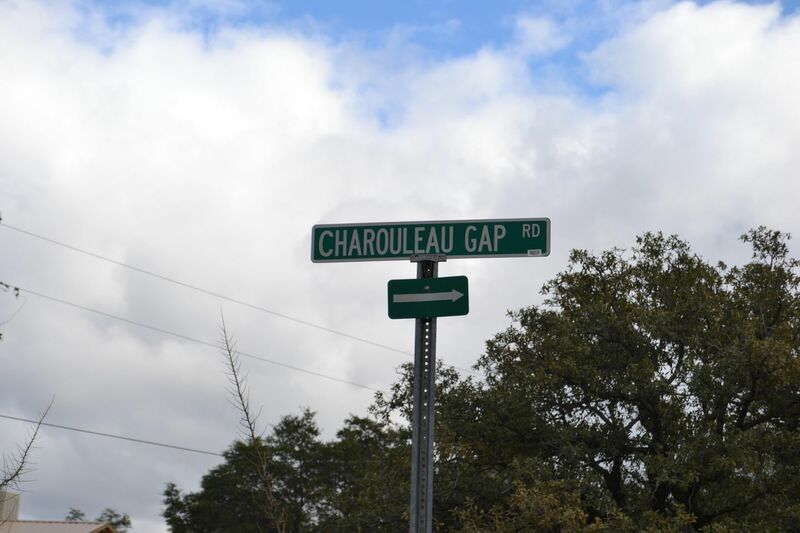 If you Google Charouleau Gap and look at images, I'm sure you'll see some 3/4 ton trucks on the trail. As for body damage, who can guarantee the day will be carnage free? 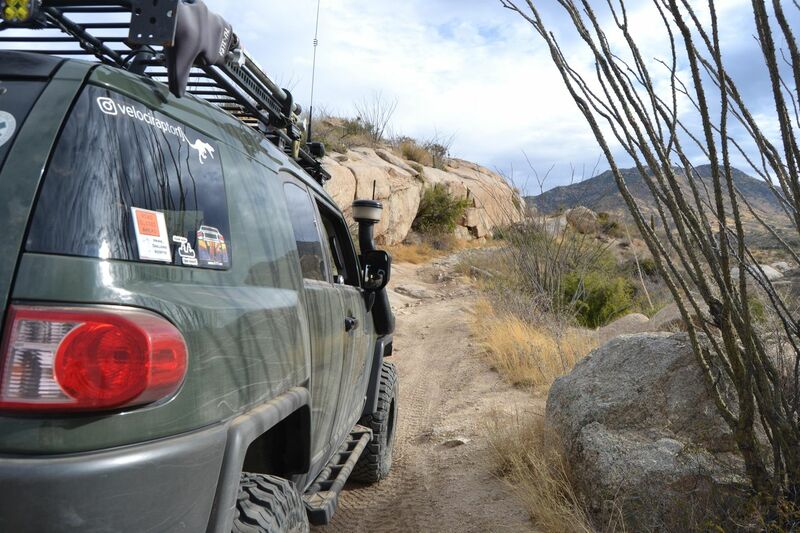 I always smack my rock rails in the Car Wash.
A: 33" is a great choice. 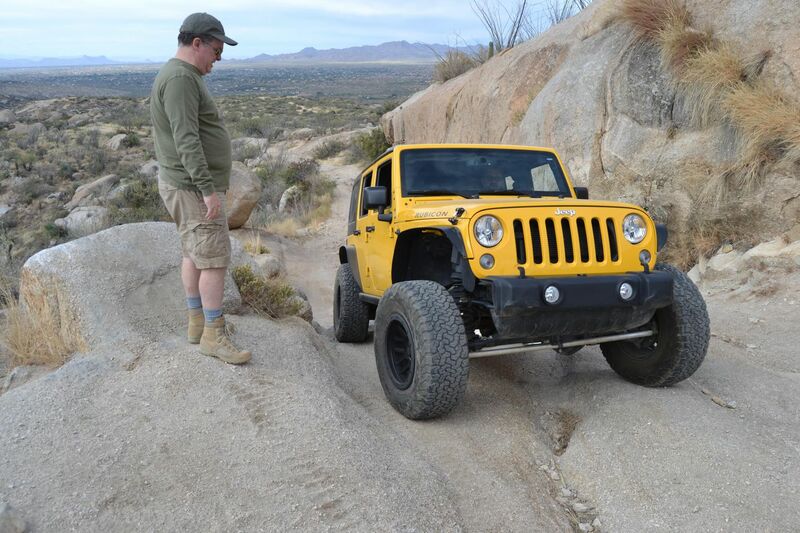 Don't scrimp on sidewall durability. 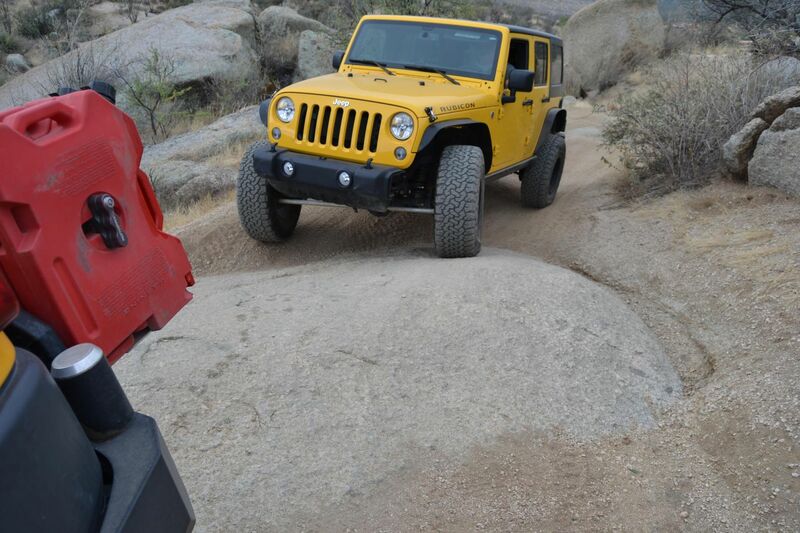 When you air down, the boulder sections will put your tires to the test. Have a good spare handy. 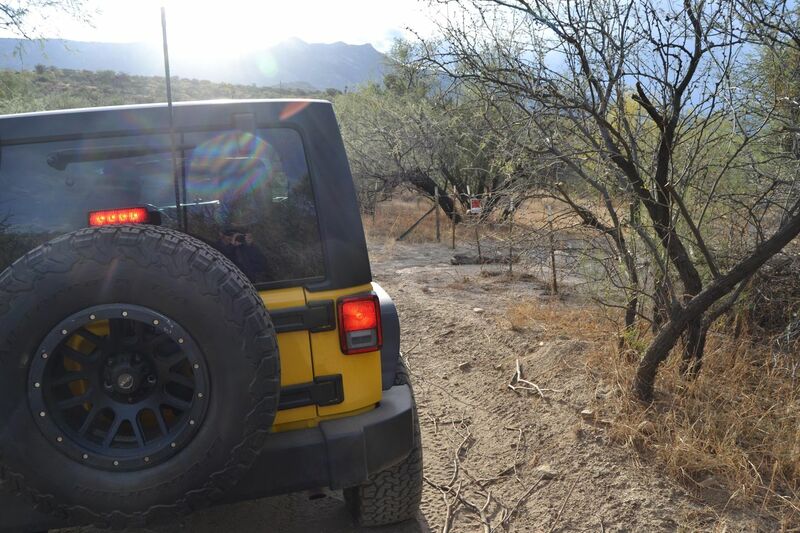 One of my favorite trails in the Tucson area. 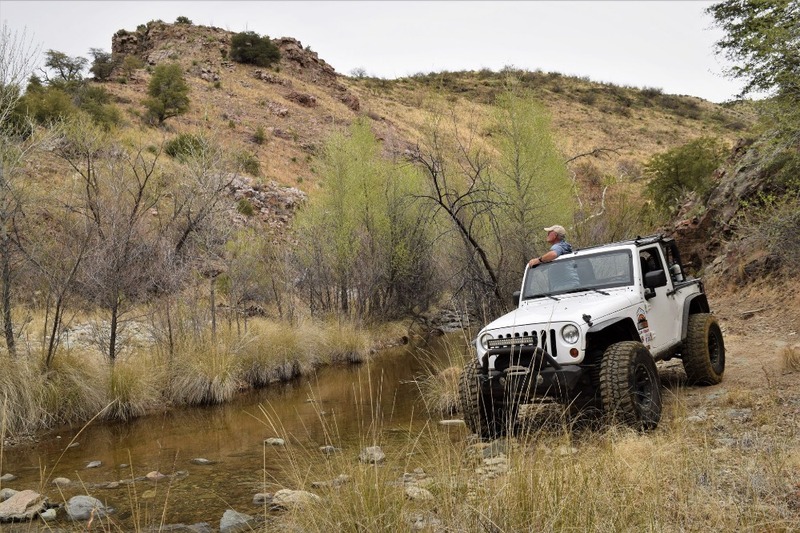 It has everything, rock crawling, hill climbs, water crosssings and incredible scenery. 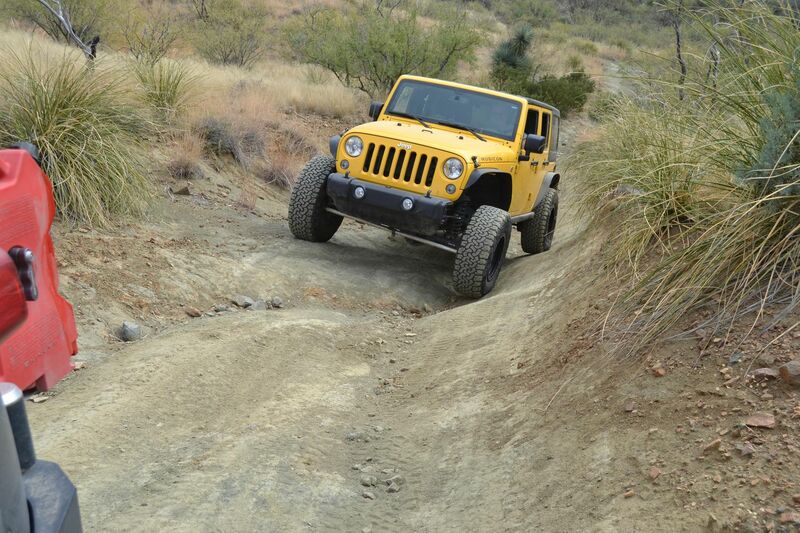 The trail always has it's challenges but with careful spotting and the right line, you can get through everything. 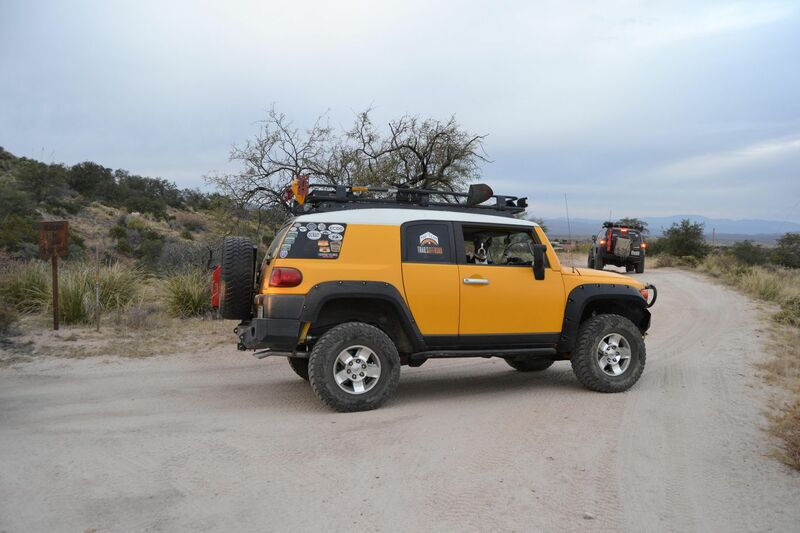 We enjoyed hiking into a couple canyons and found a couple vistas on some side trails.